Continue your tour through Orange where the coming of the railroad had an unmistakeable impact and transformed the town in many ways. [4.41] Looking again at our 1925 Price and Lee New Haven city directory map, we can see the next three crossings. Dogman's is at the blue arrow. Even though it says Dogburn there, if you follow that road, which is now the Orange-West Haven border, it curves around below to become Dogman Rd. 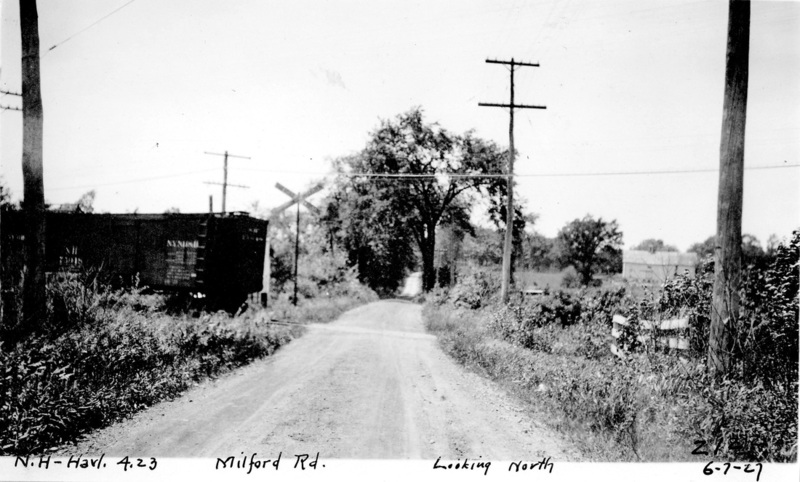 The green arrow points to what the PUC called Milford Rd., perhaps confusing that name with Meloy Rd., which you can see to the lower right. The next crossing at the red arrow is what the PUC and the valuation map calls Old Colony Rd., which we know today as Dogburn La. 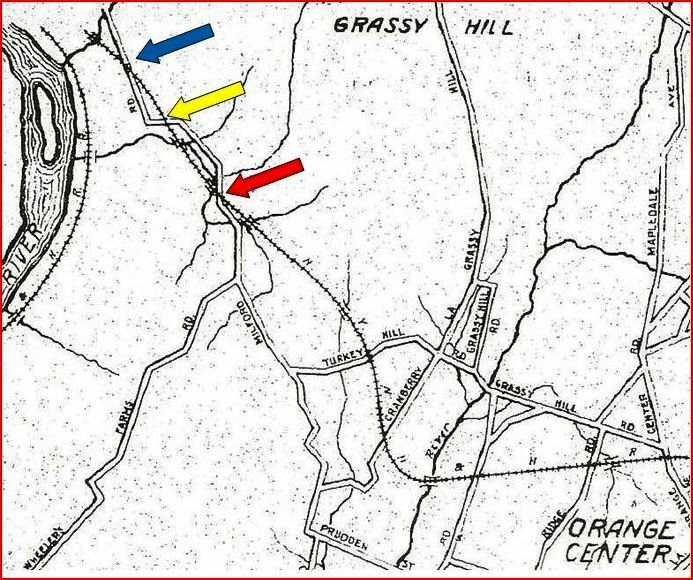 The yellow arrow is New Haven Ave., which, if followed to the left, goes to Tyler City. [4.41.1] This is Dogman's crossing, also known as Allen's or Kennedy's, mileage point 4.11, at the blue arrow to the on the map above. 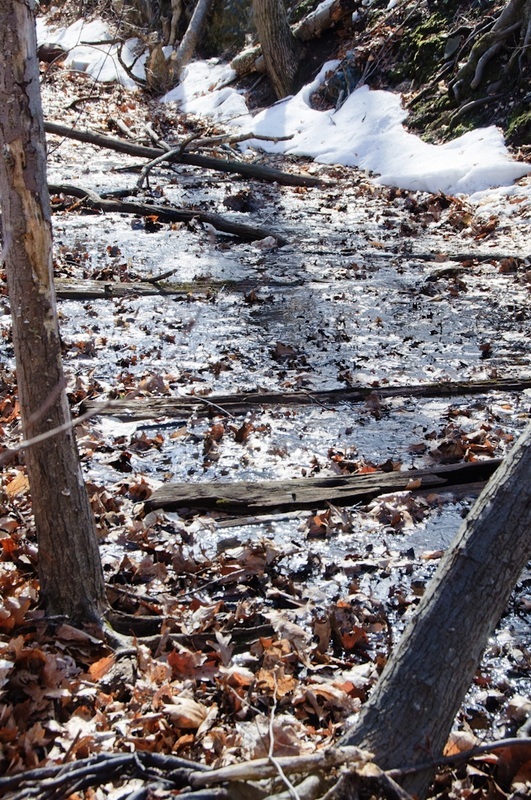 This appears on the map to be a dead-end road but on older maps we have seen this road went considerably farther north. Apparently there was a crossing of enough importance to make it onto the official list at this mileage point. [4.41.2] This photo accompanied a front-page article in the Register about an accident at Dogman crossing [NHER/06/14/1910/01]. Thomas N. Bronson, a farm hand, was killed when a westbound NYNH&H train hit his milk wagon and two-horse team. 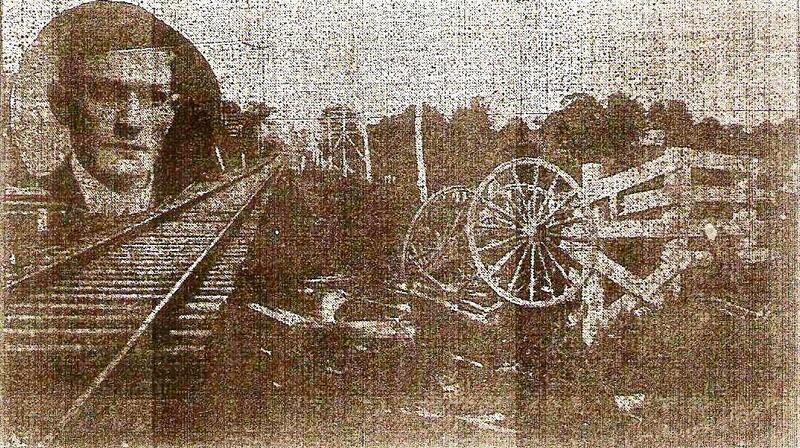 The wrecked carriage was dragged 75 feet down the track. Bronson was put aboard the train but died as the train reached Derby. He had just built a home in Tyler City where he intended to live after his upcoming wedding. 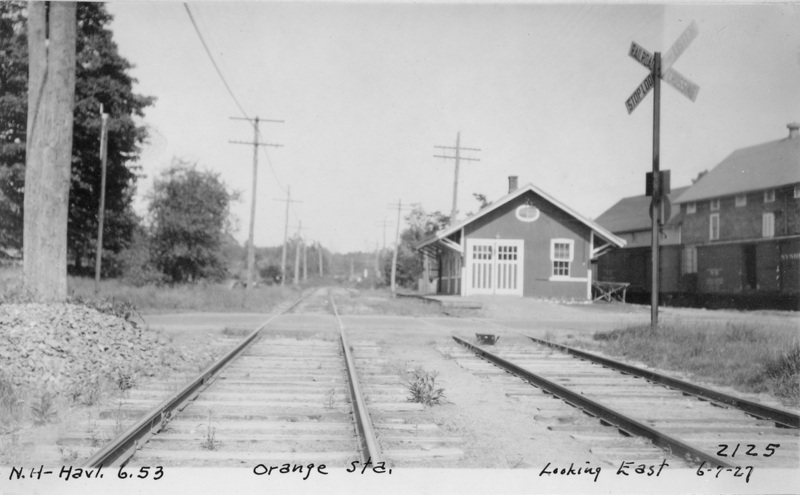 The railroad commissioners held hearings in 1910 on the dangers of the Orange crossings and decided to put a flagman at Orange Center but not here, even though this was a busy, unprotected point with a dozen or more daily trains. [4.41.3] These photos have mileage point numbers of 4.29 (1923) and 4.23 (1927) which would place them here, but we have never seen this called Milford Rd. otherwise. The PUC perhaps confused the name with Meloy Rd. which you can see on the map above, and which ran to about this point. They do equate this crossing with ALLINGS CROSSING, also called SHELDONS, after prominent resident J. Sheldon Alling. The NH&D had a stop here from August of 1871 until June of 1872 when the Tyler City station opened just to the west. In an accident here in 1905 in which Samuel Casner was killed by a train hitting his car, the location was called Plunkitt's crossing in The New York Times but Allings Crossing in the Hartford Courant [NYT/09/25/1905/09; HC/09/25/1905 /11]. A warning bell was finally installed here on 7/31/15 because of the new fatality of motorcyclist Paul Jansen on 5/31/1915 [PUC Dkt. 1568] and injuries and damages when "northbound" train #1418 struck Daniel Durkin and his double team at 11:55 a.m. on 5/26/1914. The warning devices were removed on 6/16/1927 [PUC Dkt. 4920] shortly after passenger service was discontinued in 1925 and this was made a stop-and-flag crossing for the remaining freight service on the line. [4.41.4] The blue arrows point to what the valuation maps and the PUC, perhaps following them, called Old Colony Rd., a name found nowhere else thus far in the historical record. Both of these these Milford-Orange city directory maps label the road at this crossing as Dogburn Lane. 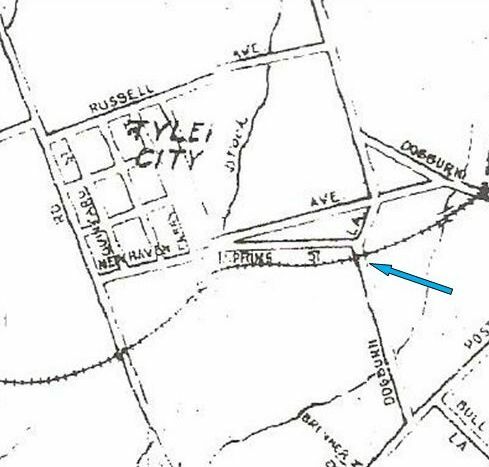 The map to the left (1927) labels Alling St. as part of Dogburn Lane, The map to the right (1953) has the portion of this road starting above the jog at Spring St. labeled as Alling St., which is correct as far back as the 1872 Tyler City prospectus map. The Alling name, now gone from this street, endures elsewhere for these historic families, several of whom were still seen in the 1931 Atlas of New Haven County, Connecticut [Dolph & Stewart, plate 29] that we also consulted. This alternation in street names was settled by 1959 in favor of Dogburn Lane, which reportedly recalls a native American ritual sacrifice here. Dogburn Rd. at the far right of this map is Dogwood Rd. today. The several 'Dog' names are still perplexing even in 2015. 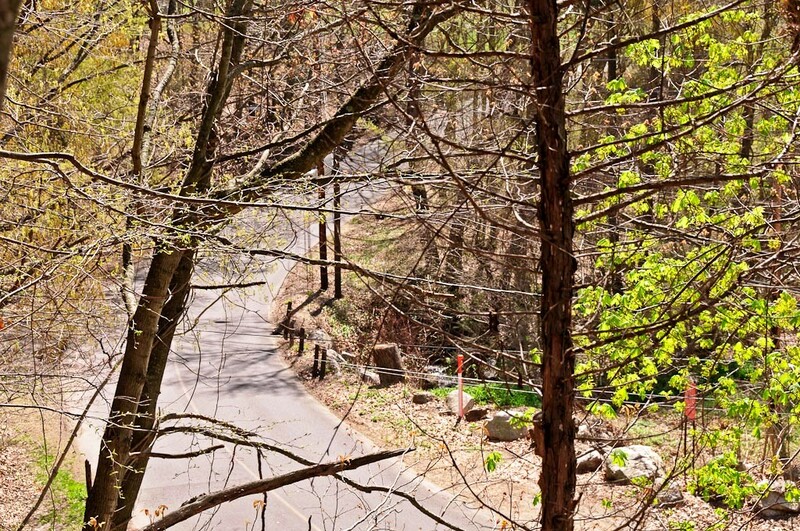 [4.41.5] The photograph on the left shows the Old Colony Rd. 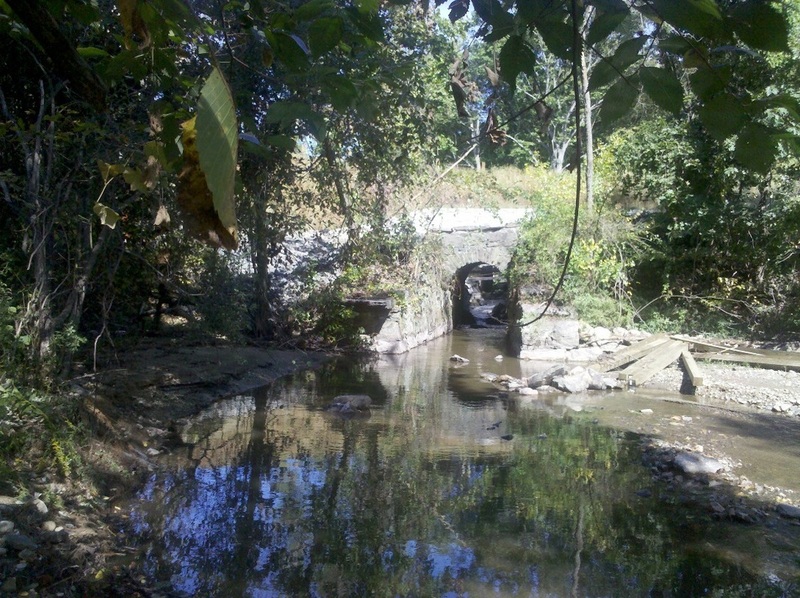 crossing, which is found on the valuation maps [click here] for the road we call Dogburn La. 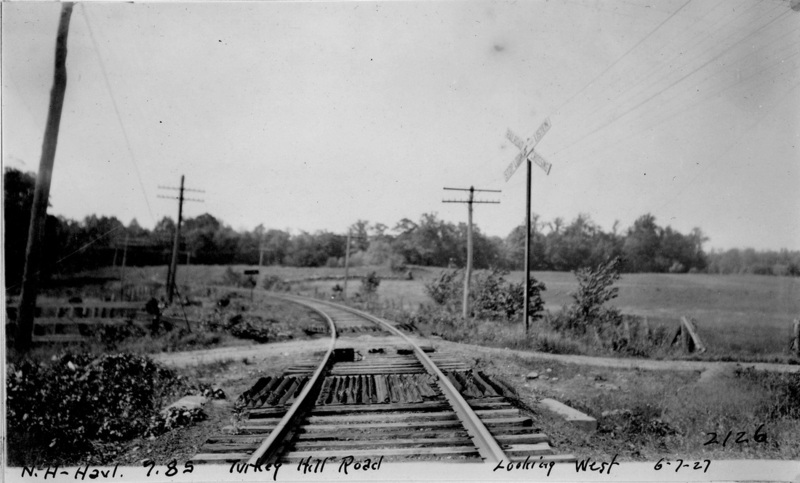 The mileage point of 4.60 in this 1924 photograph is correct for this location, with Tyler City station .37 miles west of here. The business car on the rear end of the train is on the east side of the crossing. This either means that the train was backing up to give the inspectors a forward-looking view or that it started at Derby Jct. and is headed eastward for New Haven, though that would put the mileage points in reverse of the westward order in which they proceed on this line. 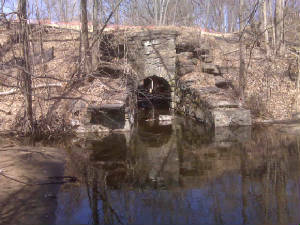 The shot on the left is of a small, original NH&D drainage culvert reported to be just west of this crossing. 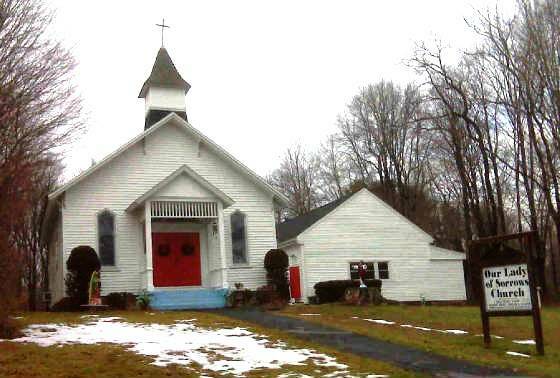 [4.41.7] The building on the left, Our Lady of Sorrows Church at 378 Spring St., is the 1874 Tyler City schoolhouse. 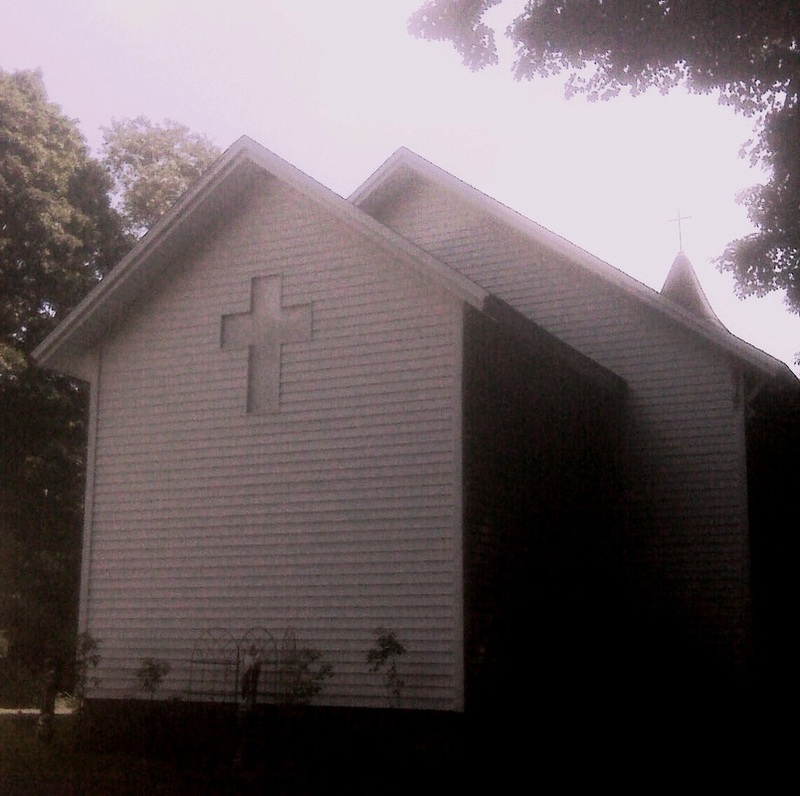 It was decommissioned in 1909 and remodeled by successive church groups for ecclesiastical purposes. This has meant the addition of the two narrow windows on the south side seen here, the construction of a lower profile sanctuary area on the north end, and the installation of stained glass windows throughout. This location is just east of the site of the Tyler City railroad station where classes were first held in 1873. 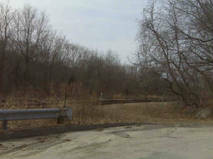 The track ran on the south side of Spring St., just behind where the photographer is standing in the photo at left. 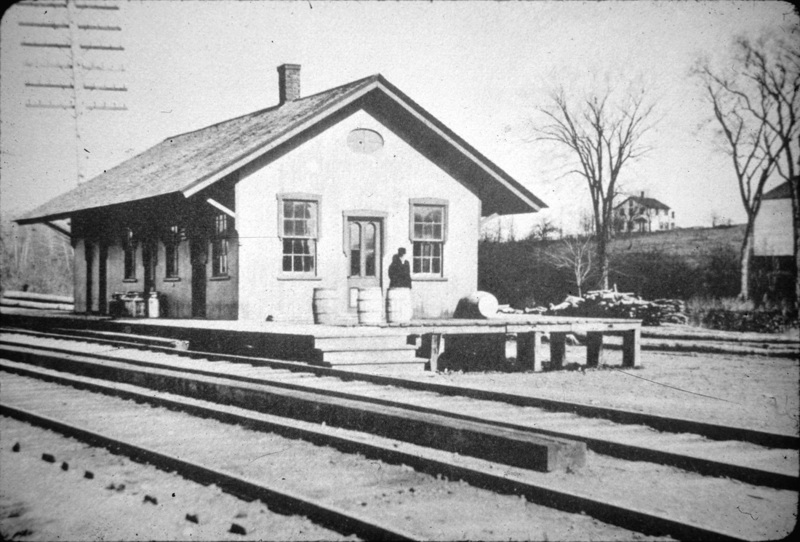 [4.42] This is the 1872 Tyler City station that stood along New Haven Ave. in Orange. It was built by Philander Ferry and Samuel Halliwell, promoters of the visionary railroad boom town, and given to the railroad on condition that trains stop here. In contradiction to many chroniclers, timetables show that trains stopped here regularly until 1877 when, perhaps because the vision was fading, Tyler City became a flag stop, but, even then, one morning and one evening train stopped here regularly [NHJC/06/04/1877/02]. More frequent regular service returned in the 1880s and 1890s. The station burned on July 4, 1936, the victim of holiday revelry, perhaps not altogether unlike New Haven's Austin depot that was destroyed by fire in 1894: see Track 6, MP 6.7. 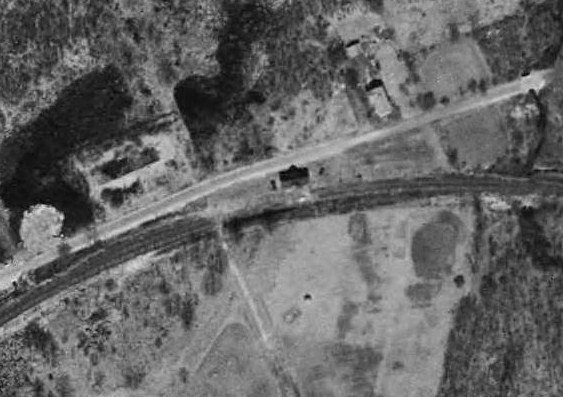 [4.43] The Tyler City station is clearly still standing in March of 1934, the aerial outline matching its photo. The building over to its right on the north side of New Haven Ave. is the general store and post office. A few homes just to the west are out of sight here but the visionary Tyler City is undeveloped otherwise. 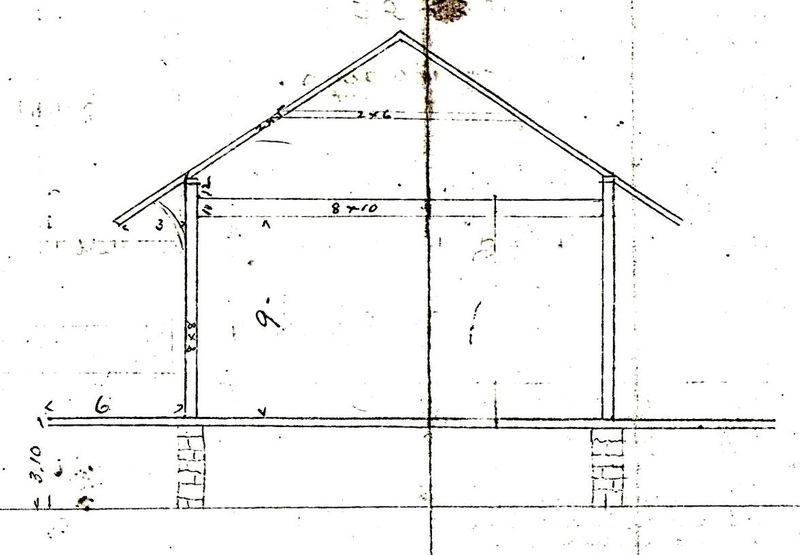 The large rectangle, west of both the station and the remnants of Harrison Ave., is the footprint of the factory building built by Samuel Halliwell, one of the 'proprietors' of Tyler City. [4.44] This PUC photo is somewhat problematic. Ferry Ave. was in Tyler City and no other street in Orange is thus far known to have been so named. 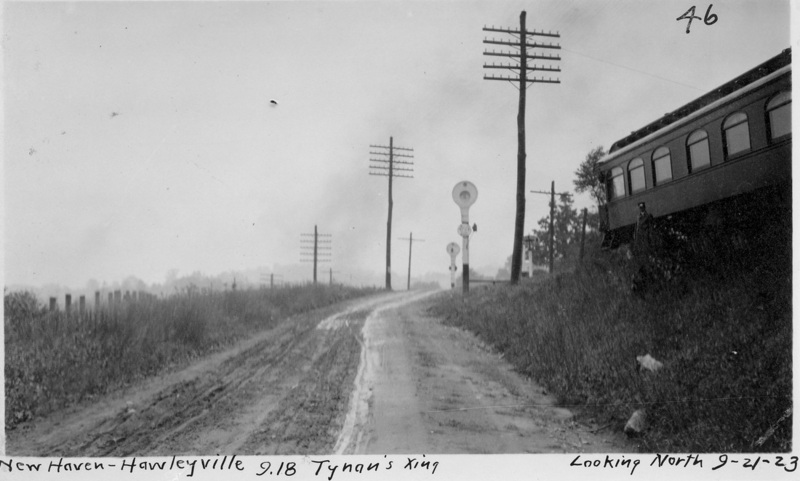 If you scroll to the right of the same valuation map referred to above [click here], it shows Ferry Ave., 'closed' even in 1915, just west of the Tyler City station. As seen in the 1934 aerial map just above, even 70 years later some of the Tyler City streets are shown going across the NH&D track below New Haven Ave. This northward looking shot fits perfectly for a mileage point of about 5.11, which appears to be what this photograph read before the numerals were altered in black. The 6.17 mileage point would make the location a mile farther west, about where the NH&D crossed Tyler City Rd., which they seem to be calling Ferry Ave, perhaps because of the doctored mileage point on this photo. See MP 4.46.2 for other location. If you click to enlarge this photo, you can see that the car is lettered 'England,' likely for the Central New England Rwy., this probably being its #300 business car. The CNE was a property that the NYNH&H controlled as of 1904 and would merge out of existence in 1927. Richard Fleischer notes that there is a useful article about these official business cars in Shoreliner 26.1 (1995) pp. 22-39. This same car appears in the other 9/16/24 PUC inspection photos at MP 4.41.1 and 4.41.5. 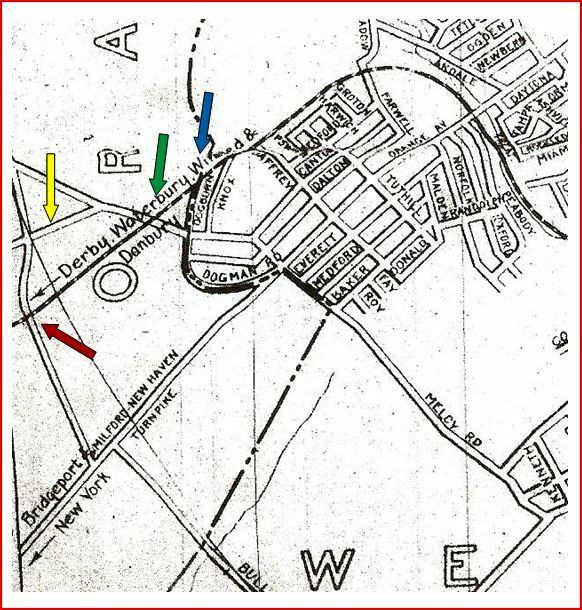 [4.45] This shot from a 1927 city directory map shows the crossing at Bradley Ave. (blue arrow), by then known as Racebrook Rd. It also shows the next crossings at Lambert and Porter, Tyler City, and Orange Center Rds. 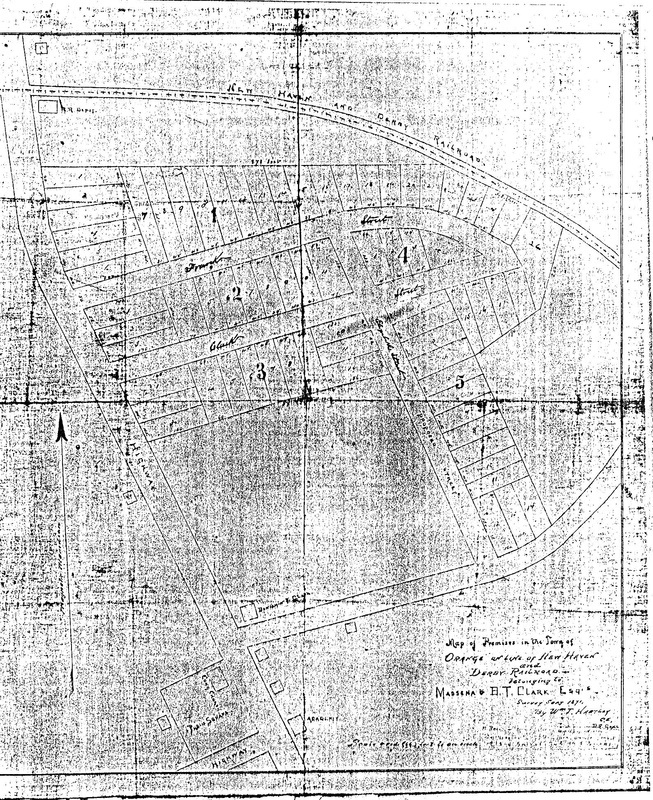 NHER/12/27/1909/09 also mentions a Peterson's crossing, just west of Tyler City, perhaps one of the planned streets that show on some maps going across the tracks below New Haven Ave. in the area east of the blue arrow. The railroad real estate map at right is c1900. 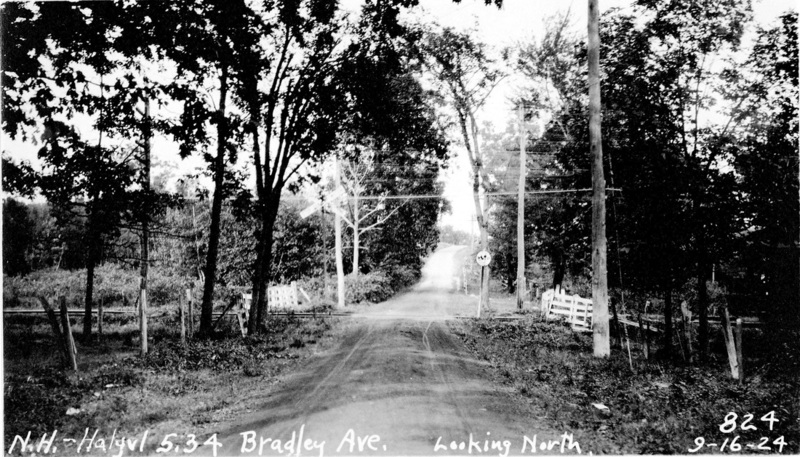 [4.45.1] These are two shots of the crossing at Bradley Ave., now Racebrook, Rd., mileage point 5.28 (1927) and 5.34 (1924) from New Haven. The Lewis Bradley farm, ahead on the right, is out of sight in the upper photo. The lower shot shows track heading westward toward Platt Valley Rd. Seen here and elsewhere in these PUC photos are the fences and cattle guards designed to keep livestock from wandering onto the tracks. The guards [click here] were the V-shaped strips of metal or wood that were attached to the ties between and to each side of the rails where the fencing left off at crossings. The vertical placement made it difficult, if not impossible, for cattle to pass these simple barriers. 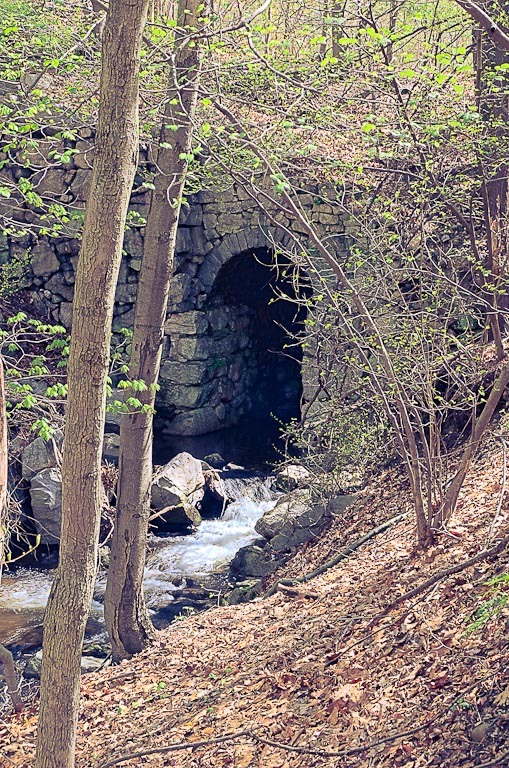 [4.45.2] Who among us devotees of railroad history would not want property with an abandoned railroad right of way, an old culvert, and a stream to play in? This shot is of two children enjoying just such a scenario along the Platt River in Orange on the east side of Lambert Rd. The setting corresponds to the point shown under 'O. Treat' on the 1868 map at left. 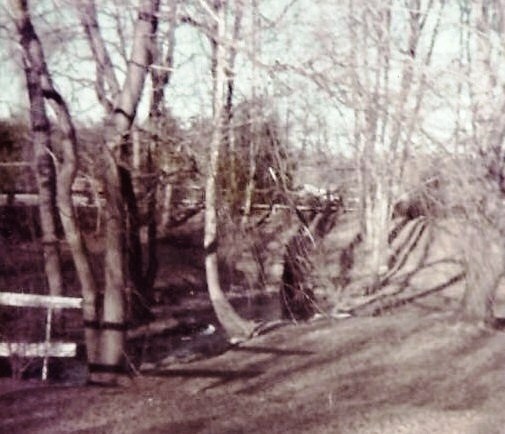 The NH&D embankment is in the background in the photo and the culvert is behind the boy who is standing on a makeshift bridge of railroad ties. 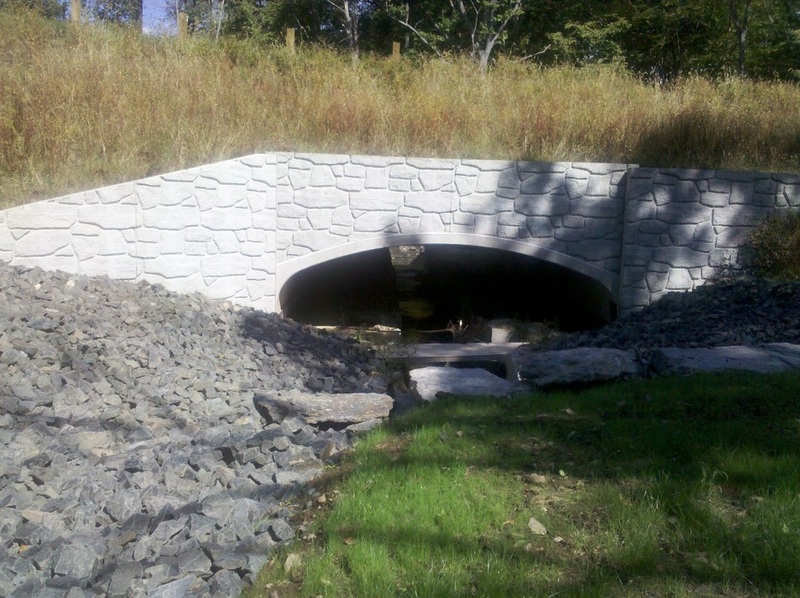 [4.45.2] After a century and a quarter of service, this culvert threatened to collapse a few years ago and was shored up with a concrete insert. All vestiges of the beautiful old stone arch appear to be gone now. 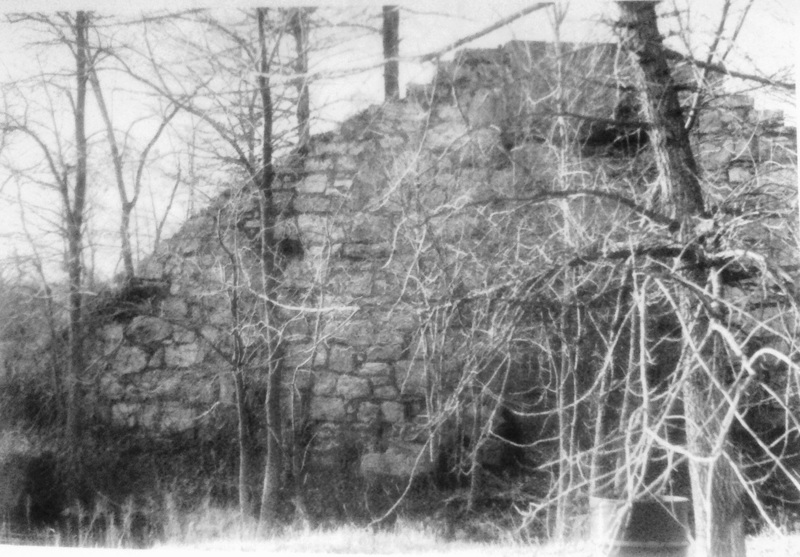 The original culvert may have dated to 1882 when the railroad commissioners reported that some of the Platte (sic) valley trestle was filled in [CRC30.1883.21]. Lambert Rd., then called Platt Valley Rd., is to the right of 'Derby' on the 1868 map shot. Note the short diagonal portion of roadway paralleling the track on the eastand the Platt River running under the track and the road at that point. 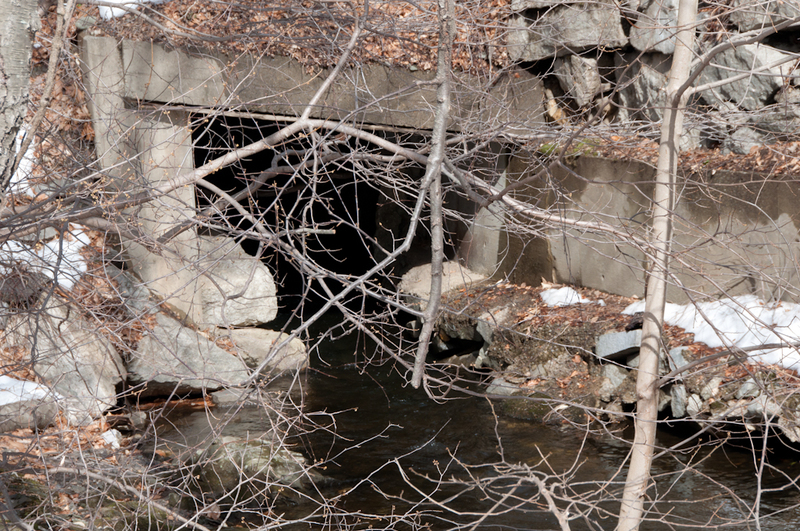 The culvert location is easily visible, when the leaves are off the trees, as seen in these two winter 2011 shots. 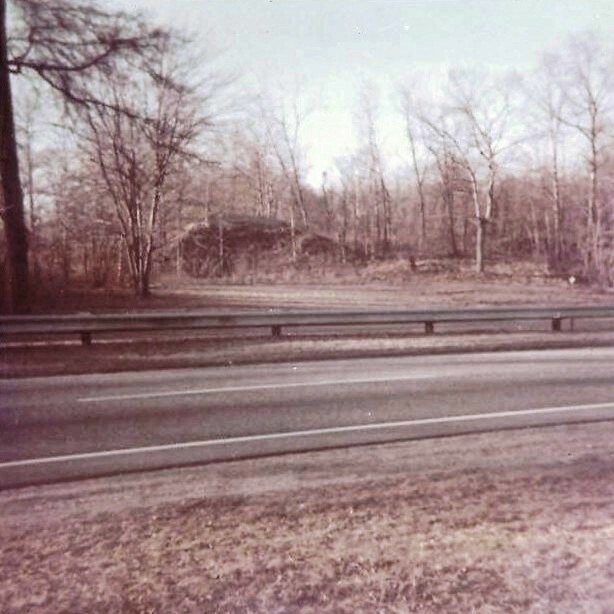 [4.46] The shot to the left is the NH&D bridge over Platt Valley Rd., now Lambert Rd., at the intersection of Porter Lane, just west of the culvert. This was mile point 5.91 in 1928. The view looks north according to the notation on the photo. 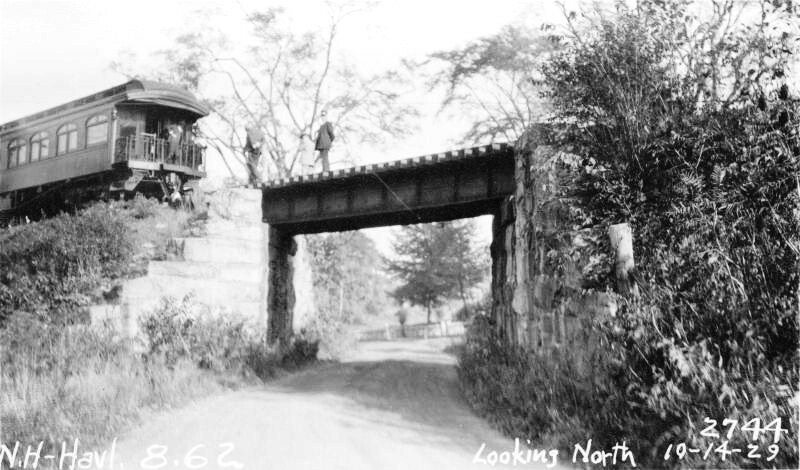 In 1871 when the railroad came through, the intersection was on a diagonal as was the NH&D overhead bridge. See the map above. 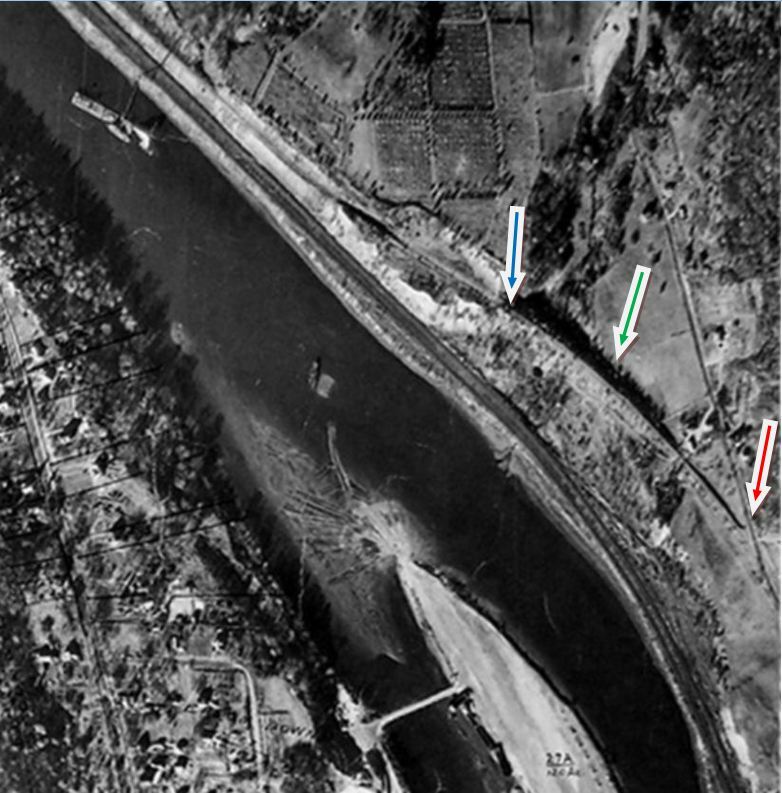 The photo on the right predates 1965 when it was published and shows the northwest abutment of the bridge still at the side of the road. Its twin on the southeast side was already gone. The entire intersection was subsequently redesigned to eliminate the diagonal and presumably the remaining abutment was removed at that time. A residence on the northwest corner of Porter Lane and Lambert Rd. today now obscures the embankment behind it. [4.46.1] The section of track from Lambert Rd. 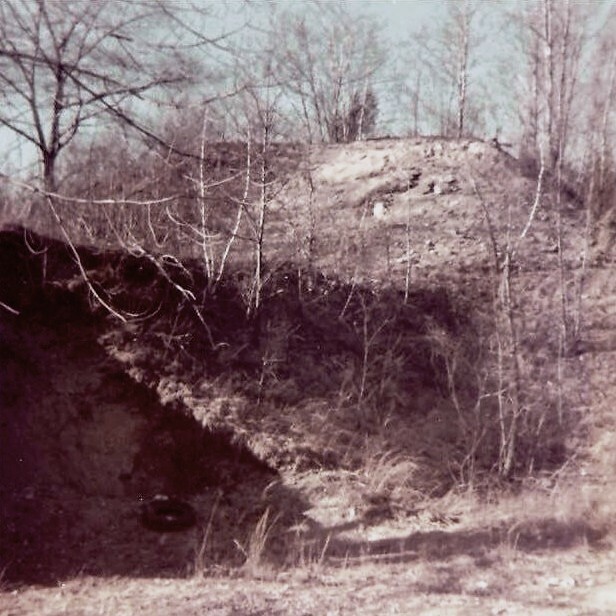 to Tyler City Road began on trestle and later filled embankment at the southeastern end and quickly had to work its way through a sizeable cut that was blasted through the rock. Some intrepid members of the New Haven & Derby Model R.R. Club hiked in recently and took these photos. 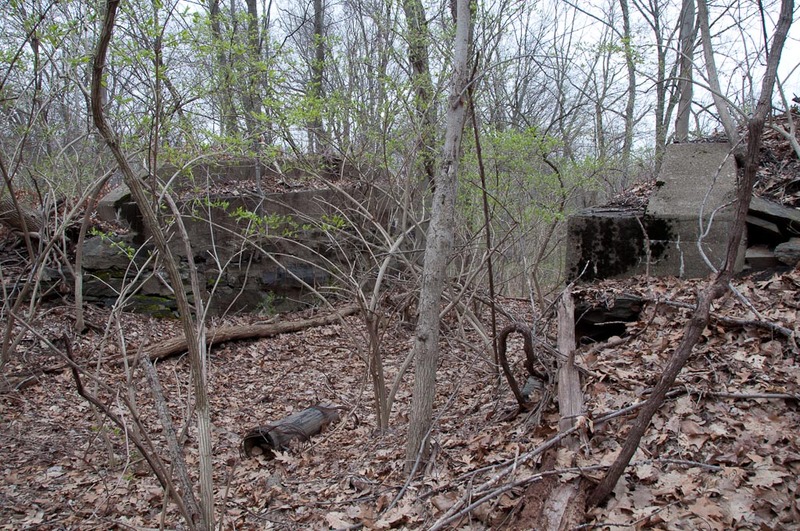 The one on the left shows ties, undoubtedly from the NYNH&H era, still in the ground. 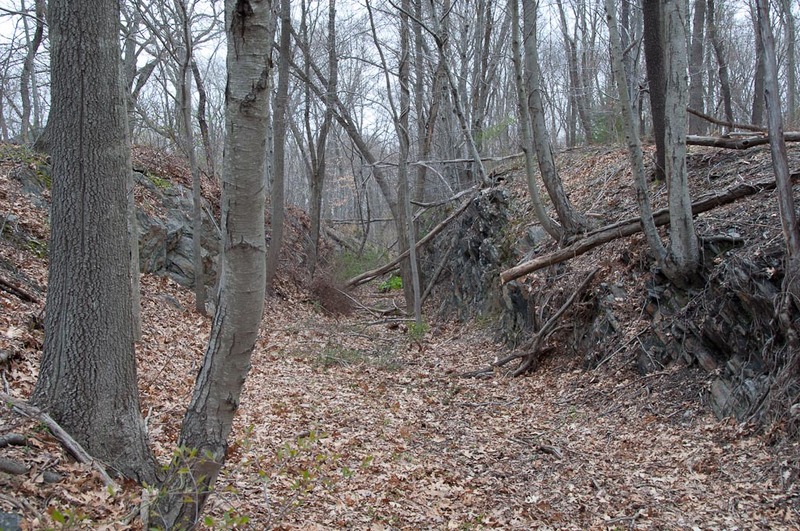 This location has to be "the cut at Platt Valley," one of the smallest on the line, but the one where Woodruff's History of Orange [p107] says a train was marooned for three days in the blizzard of 1888 [click here]. Those wanting to purchase their own copy of this classic history can now do so with the 2011 reissue by the Orange Historical Society [click here]. [4.46.2] This looks plausibly like the crossing of what we know as Tyler City Rd. at a correct mileage point of 6.17, with the track curving westward to the Orange Center station. Though the PUC says this point was also known as Malone's crossing, we know of no one else who called this street Ferry Ave. Like the other curiously mislabeled street names that the PUC used, this one would carry through until the 1938 abandonment when the PUC took this Ferry Ave. off its list of state railroad crossings. 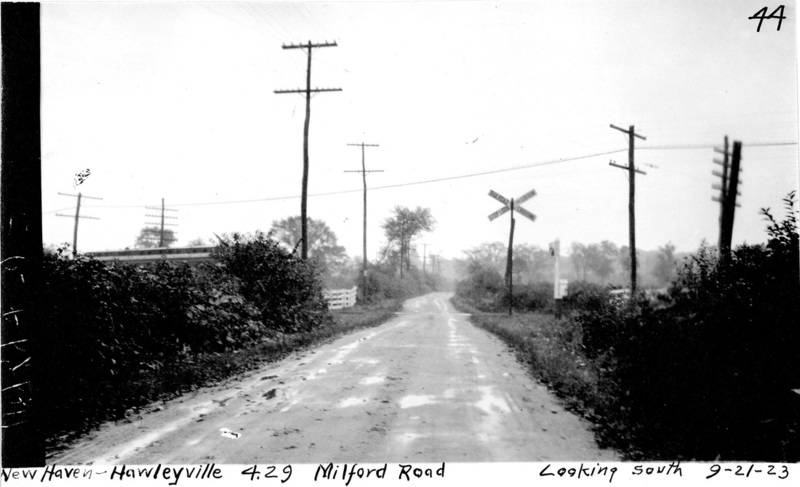 See the retouched photo at MP 4.43.1 for discussion of the 'real' Ferry Ave.
[4.46.3] The Orange station was on Orange Center Rd. where the small shopping center is now. The view looks east. 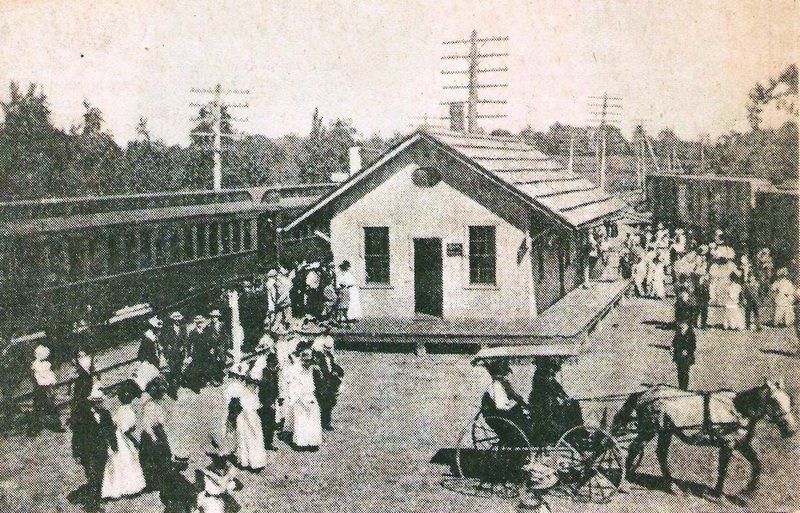 The station was built with $1003 in local funds and presented to the NH&D in a manner somewhat similar to the Tyler City station and relatively common at the time when communities wanted to guarantee that the train would stop in town. Ground was broken early in September of 1871 [NHDP/09/07/1871/01]. According to notes left by the late Harry Grillo, long-time resident and history buff, it was finished within the month, as stated in the newspapers to coincide with the annual Orange Agricultural Fair. Sidney F. Oviatt moved the post office from his house across the town green to the station [see Track 2, MP 2.2.4]. Oviatt, who served as postmaster and station agent until 1887 - he died in 1894 - is likely seen on the platform. A newspaper article in 1877 reported that there was a cannon on carriage wheels opposite the railroad station, complete with rammer and sponge and a placard saying "Don't strike here" [NHER/08/01/1877/04]. The article does not say whether the cannon was aimed at the station! 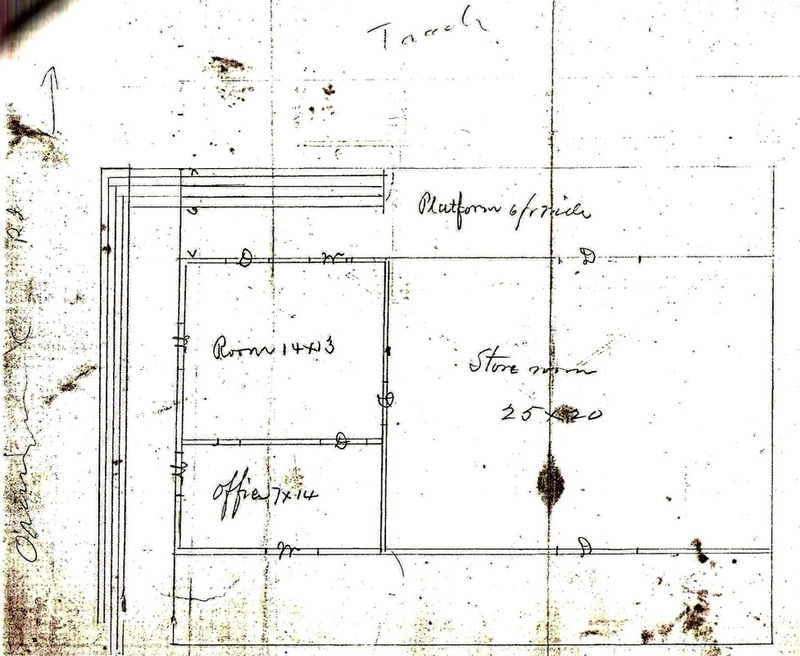 [4.46.4] Hand-written and -drawn design plans for the Orange station. These papers are in the OHS collection, along with a list of contributors who 'subscribed' funds to go toward the cost of the structure. 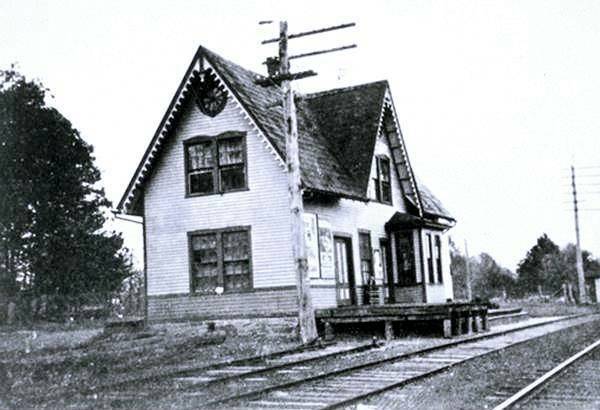 The fact that it was built with community moneys allowed this building to become town property, and, after passenger service was discontinued, it was later utilized for municipal services. [4.47] This map, found recently at OHS, shows that Tyler City was not the only real estate development that the NH&D spawned. Former postmaster Benjamin T. Clark owned a large piece of property on Orange Center Rd. below the new railroad line and depot and had it surveyed, with the apparent intention of creating some 70 building lots seen on this September, 1871 map. This even pre-dates the Tyler City survey maps: see Track 1, MP 1.11+. 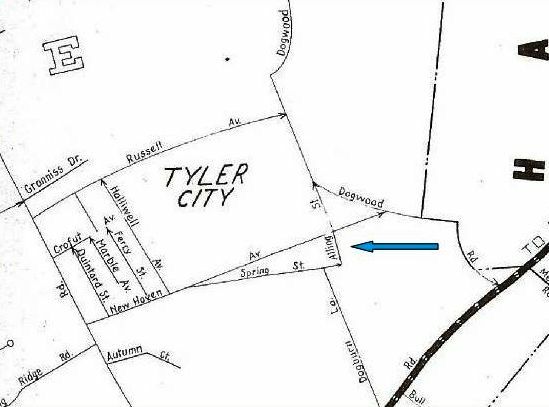 The Clark home is in the lower center at the corner of what would soon be called Tyler City Rd. The activity here merited a note in the Palladium, which said that eight new dwellings could be counted "within rifle shot" of the depot, two of which were just completed for Messrs. French and Thompson of this city, and that even "the academy" has had its roof "renewed" [NHDP/12/30/1874/04]. This 'academy' was, incidentally, the precursor of the present building on Orange Center Rd. It was sold to Leverett B. Treat and moved to the area in back of Miller's store around 1878 when the newer building was authorized by the town. Most of the extensive development foreseen here never materialized, but the proposed Frank, Clark, and Elizabeth Sts. still show up on municipal maps as late as 1941. The latter two replicate present-day Schoolhouse La. 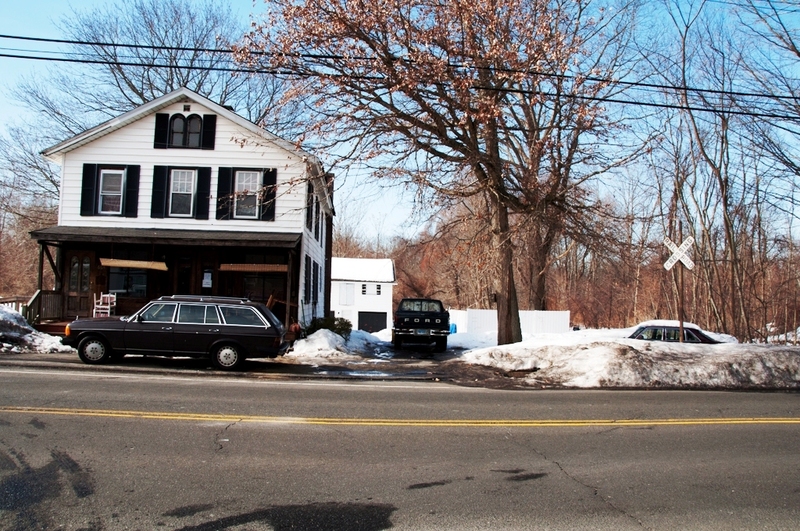 which encloses the center area, now town property that houses Mary L. Tracy school, the fire department and the town hall, the last of which is on the site of the old Clark homestead. 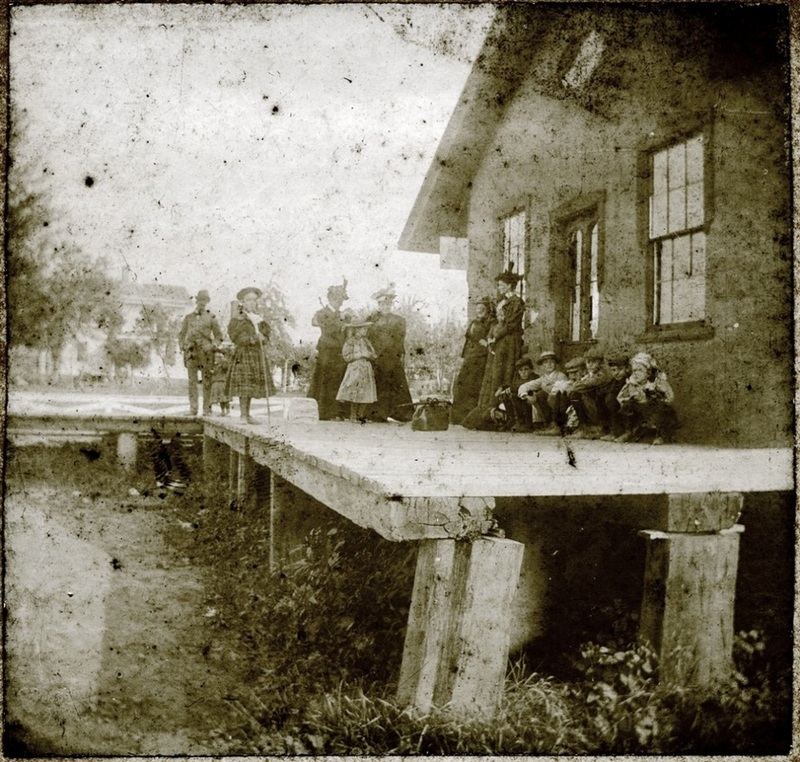 [4.47.0] Judging by the dress style, probably an 1890s shot of what appear to be school-age children and teachers or chaperones, perhaps taking the train into New Haven for the day. 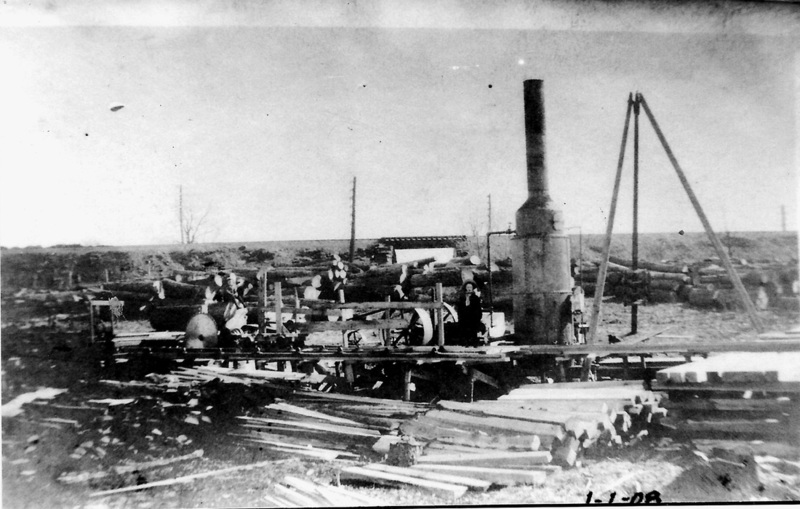 The supporting post on the corner of the platform is listing seriously, possibly after being hit by a wagon, though the one to its right appears to have been shimmed also after settling into the ground. [4.47.1] Another view of the Orange station, looking east toward Tyler City and New Haven, ca. 1908. This amount of activity at the station probably indicates a special event, perhaps the Orange Fair, an annual event that went back at least to 1871 when the NH&D opened. Mary Woodruff [p. 122; see Track 1] says the fairs, with dwindling attendance, lasted until a final one was held at Savin Rock in West Haven in 1916. An Orange Country Fair was reinstituted in 1975 and is once again a celebrated annual event. The cars on the sidingto the right show some pretty active freight business at that time as well. [4.47.2] This valuation photo, dated 10/27/1916, shows a Frisco box car on the siding that served the Woodruff seed warehouses located there and other community businesses. Most every picture we have seen, including the 1934 aerial view, shows three or four freight cars here. The wagon is perhaps picking up merchandise. Back as far as 1856, Everett B. Clark and Frank Woodruff started separate seed production operations that would flourish, with Clark's evolving by 1927 into the Associated Seed Growers, or ASGROW [click here]. These companies, plus an active farming community needing feed and fertilizer shipments, helped delay the abandonment of the line from Derby Jct. until 1941. 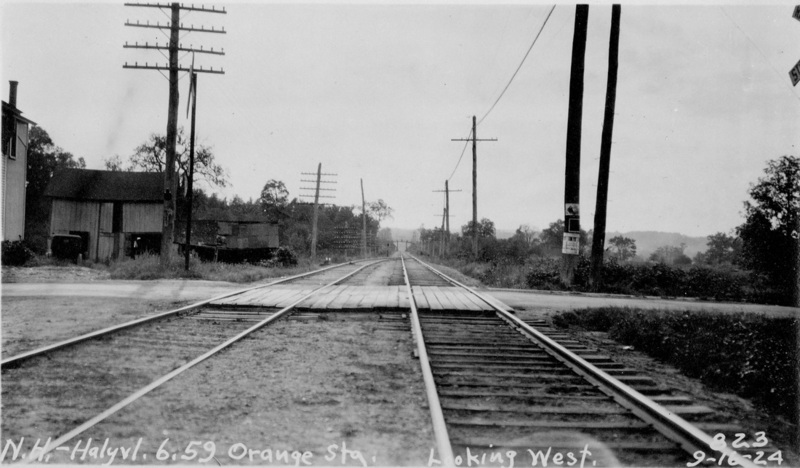 Freight service on the portion from Orange center to West Haven was discontinued in 1932: see Track 2, MP 2.54. [4.47.3] The middle image looks south on Orange Center Rd. in 1924 and shows the Scobie store on the right and the Woodruff seed warehouses on the left. 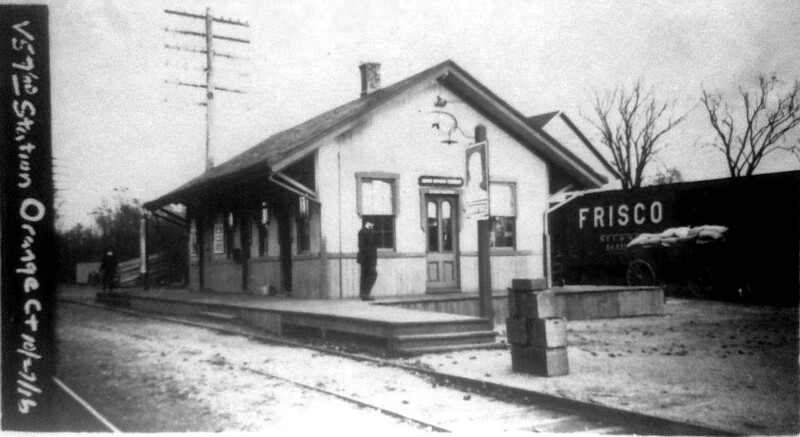 If you look closely at the edge of the station on the left side of the shot, you can see that it is not yet the firehouse as of this 9/16/1924 photograph. The doors and windows are unaltered and there appears to be a young boy on the platform. The left photo shows the Orange Center station as the volunteer fire department in 1927. This transformation came about later in 1925 after passenger service ended on June 25. The platform has been removed and it looks like the driveway has been built up to the level of the newly installed garage door. At the risk of brightening this picture excessively, we tried to illuminate the box cars sitting on the siding that served the Woodruff warehouses. 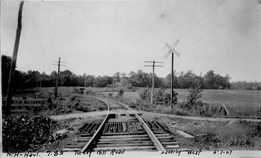 The photo at right is the view west from Orange Center Rd., with the runaround track for the station looking already disconnected at the switch. The Ridge Rd. overpass is also visible farther down the line. 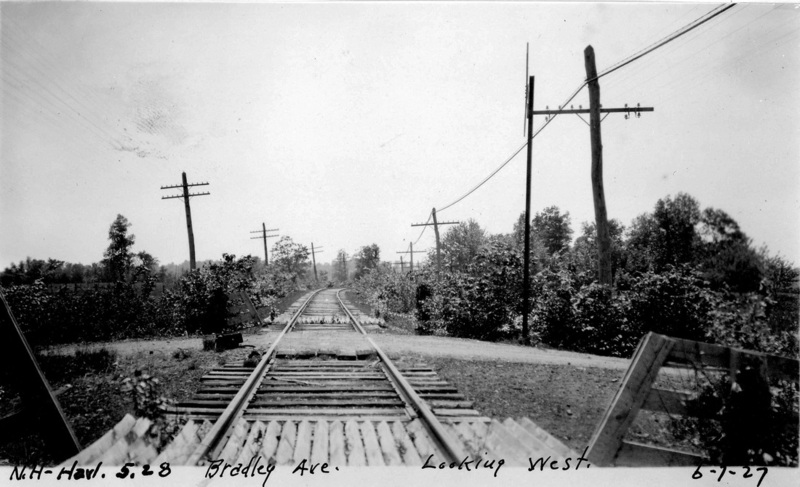 We also cannot help but notice the several telephone poles on the left (south) side of the track, each with five crossarms close to the ground and holding 10 or so wires and glass insulators. This crossing was the only one in Orange busy enough in 1910 for the railroad commissioners [RRC 23: 200; see also MP 4.41.3, above] to order an attendant and a sign saying "Flagman On Duty for Express and Through Trains Only," a posting that the railroad's "chief engineer" suggested in 1918 should be replaced "by one in conformity with present standards" [Dkt. 2963]. This probably means that no Pittsfield-bound through trains were using this line any longer and also that all remaining local trains stopped here as well, thus eliminating the need for a flagman. [4.47.4] When passenger service was discontinued in 1925, the post office was moved to Scobie's store right across Orange Center Rd. 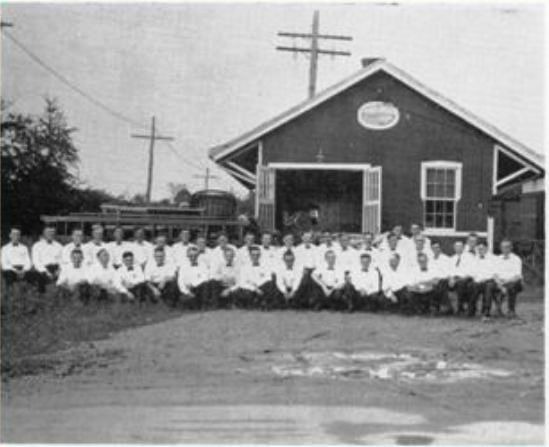 The station building, put up by the residents and thus owned by the town, became the first headquarters of the volunteer fire department, as pictured here probably in the 1940s. Thereafter it was used by the town highway department and was later offered to the American Legion post, which declined on account of the building's condition. It was torn down in 1948 and the useable lumber went into the construction of the Orange Shopping Center and Cadwell's Pharmacy. 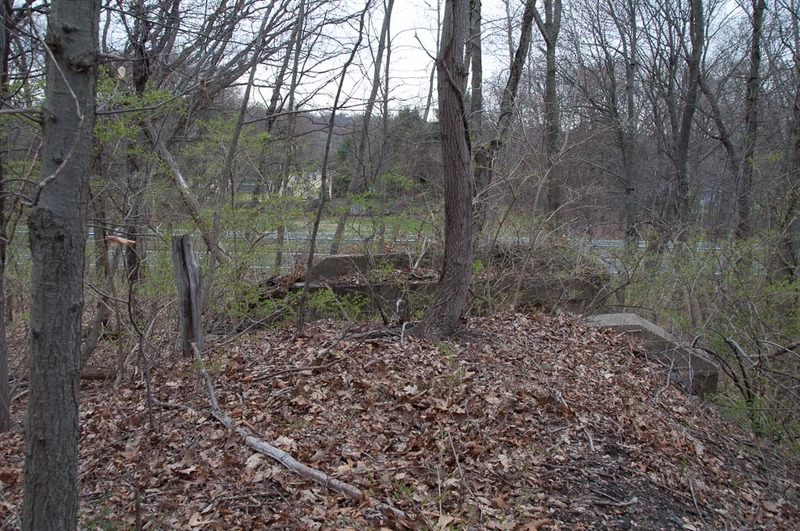 The 1.52-acre station property, inherited by the NYNH&HRR from the NH&D/HRR, was sold to the town on July 21, 1942. This information also comes from Harry Grillo. [4.47.5] The site of the former station is as it appeared ca. 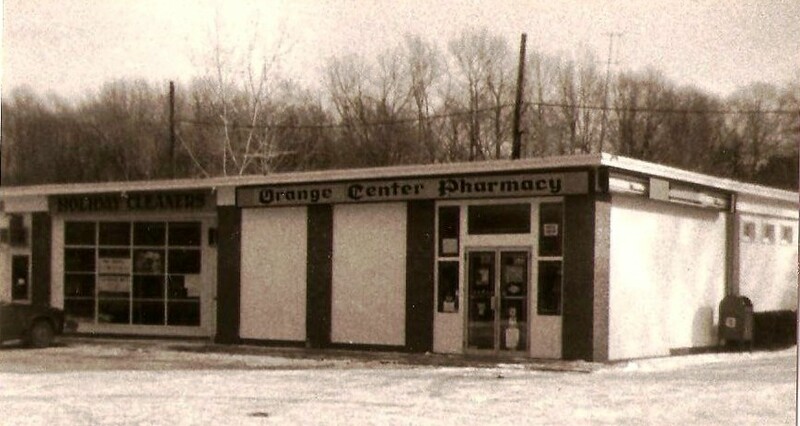 1980, with Cadwell's as the Orange Center Pharmacy. The building that housed Scobie's store, and the post office after the station gave it up in1925(? ), still stands across the street. [4.47.6] The Scobie Bros. store is seen on the left in 2010. 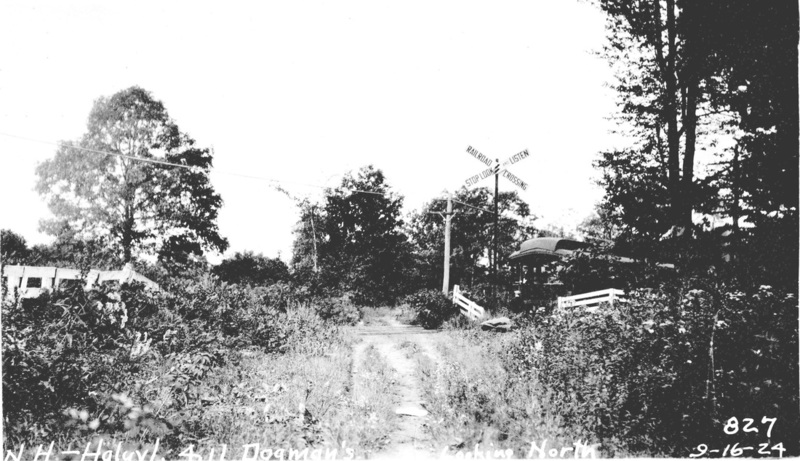 Note the crossbuck that adorns the pole to mark the former NH&D crossing. 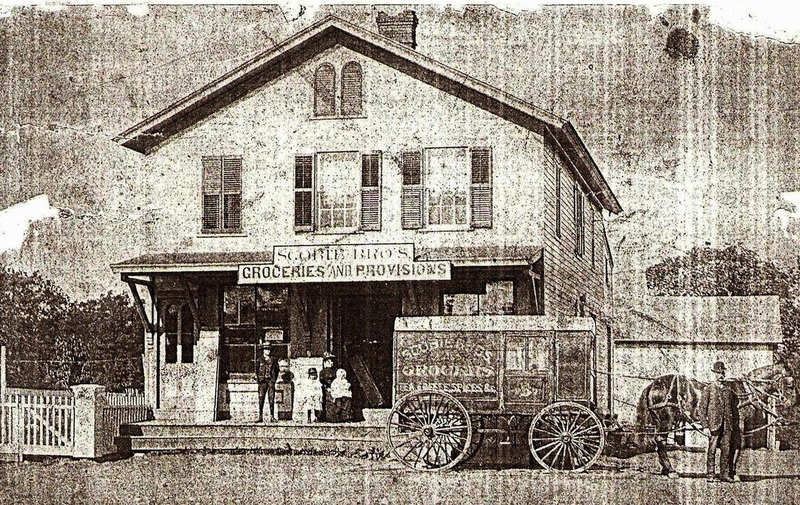 The image on the right is the store probably in the late 1800s. This was the Orange Center post office after it was moved from the depot when Sidney Oviatt gave up his duties on account of ill-health, likely in 1887. He died the following year. The post office was again moved later to the Woodruff seed warehouse on the siding at the railroad station. Elbert Scobie, himself later postmaster, produced a series of postcards that were printed in Germany and captured life as it was in Orange in the early 1900s. The railroad station view at MP 4.47.1 is one of his cards. OHS has the full set in their collections. 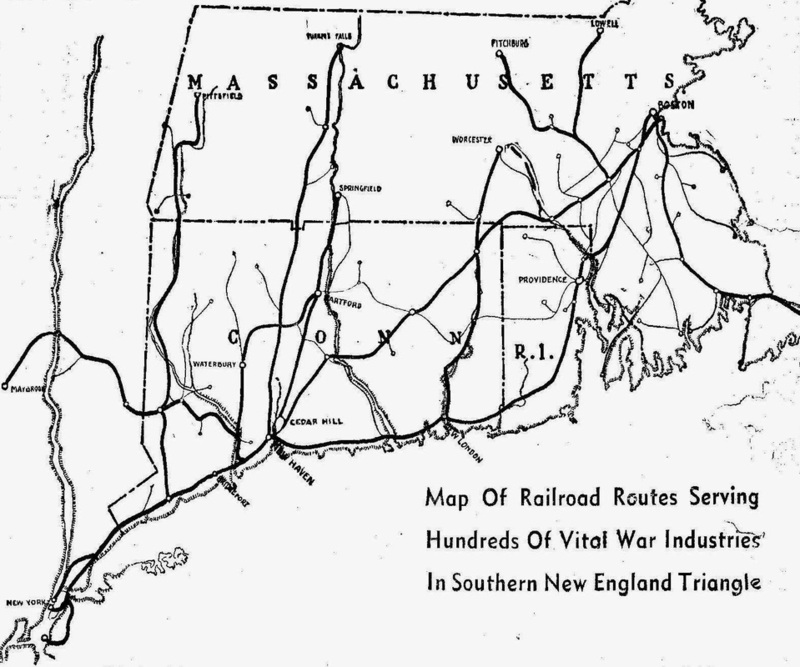 [4.47.7] This map appeared in the Register on June 14, 1942 in a feature article on the New Haven Railroad. 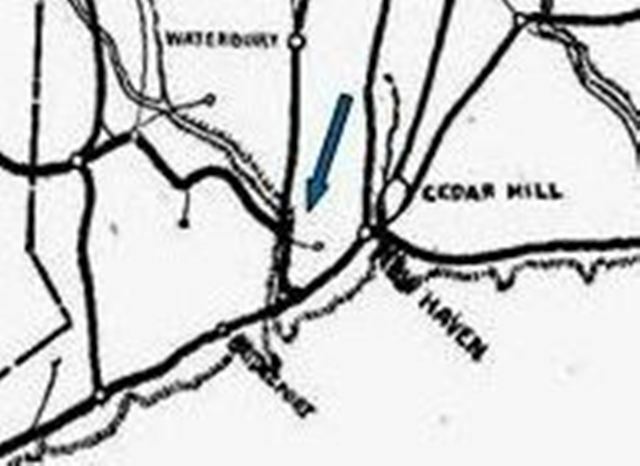 The blue arrow shows the line only as far as the center of Orange, although even this portion of the line was out of service as of May 1941. This coincided with the opening of the first leg of the Wilbur Cross Pkwy that year and the state's refusal to build a railroad bridge over the parkway. 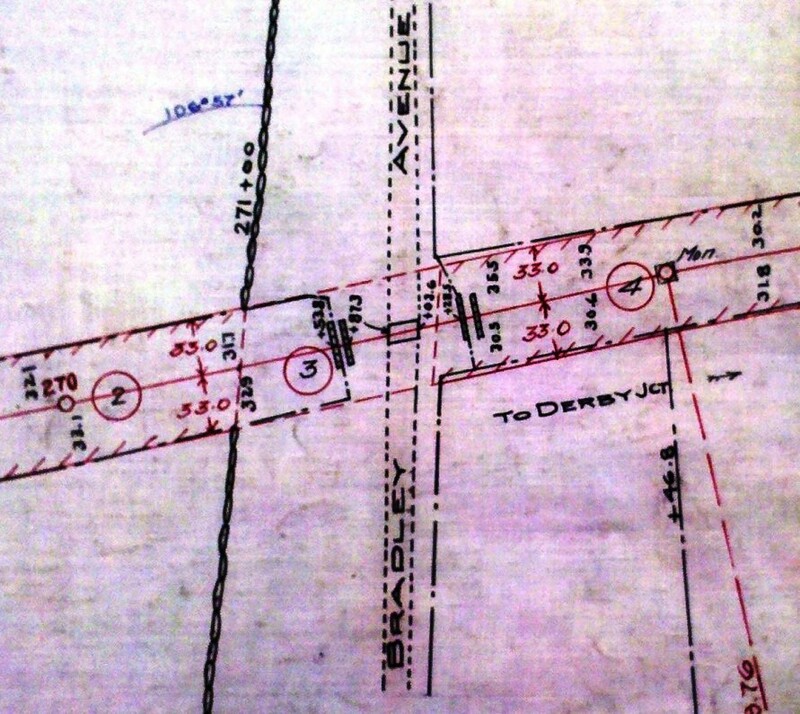 As we now know, this map accurately reflects track still on the ground as of mid-1941, rails on the eastern portion from Orange to West Haven, taken up by 1939: see Track 2, MP 2.5.4. Track on the Derby Jct. 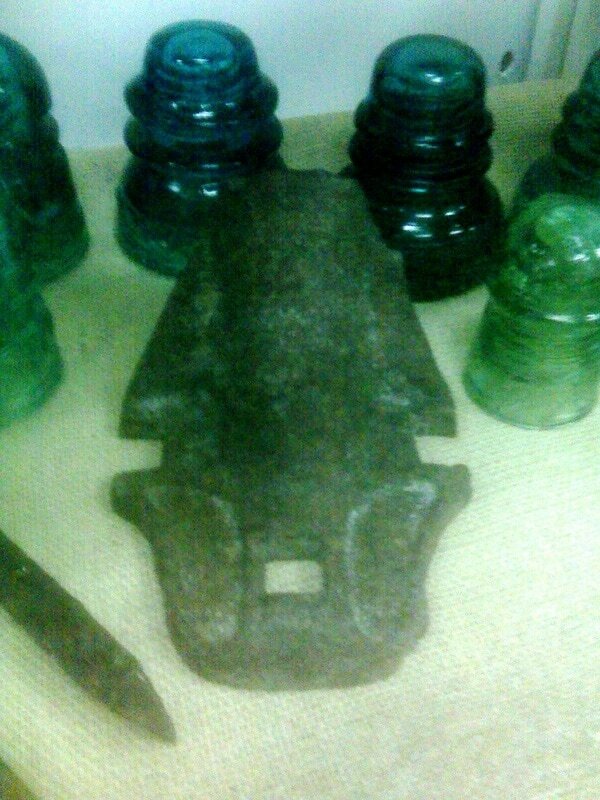 to Orange portion was probably taken up later in 1941 or in 1942 for steel needed in the war effort. 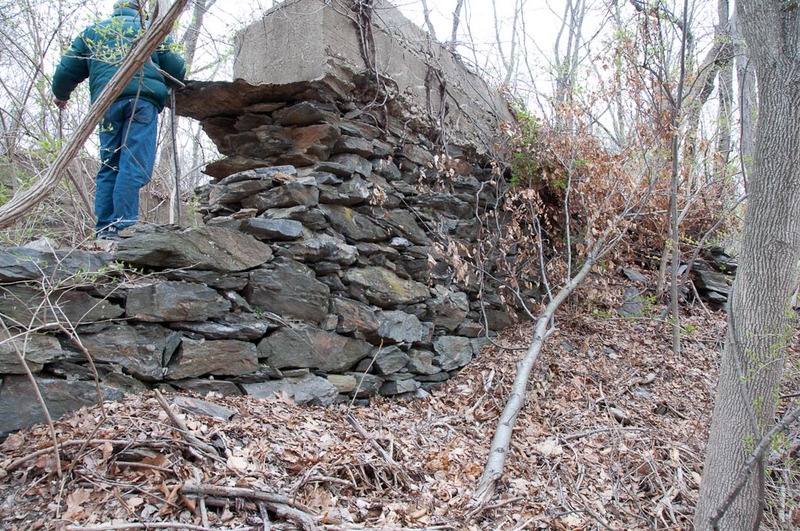 [4.48] Judging by the considerably lower level of the NH&D right of way, we are going to assume that a bridge was always needed here after the railroad was put in. It may, in fact, always have been the wooden structure seen in this photo at mileage point 6.84. This street, called Ridge Rd. today and on maps back to the 1920s, was also known as Henry Clark's Road - he lived a short distance south of this point - as well as Orange Rd. and Milford Rd or Old Milford Rd. [4.49] This is another scan from the 1934 aerial map collection. 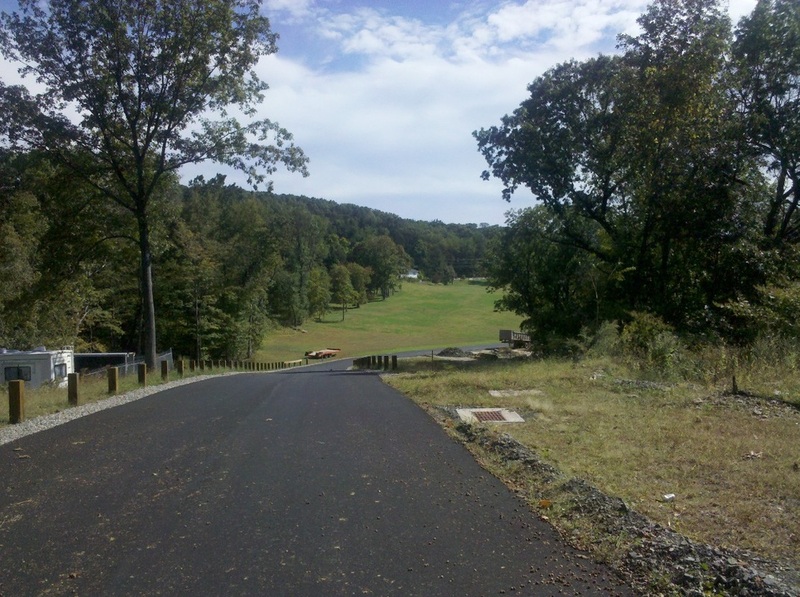 The road running on the right is Grassy Hill Rd. with an overhead railroad bridge. The next bridge to the left is over the Wepawaug River. Unfortunately, the PUC photographs we have do not include bridges over water. It is not known if any photos survive of the 'tin bridge' over the river here. The furthest bridge to the left is over Cranberry Rd. See the following photos. 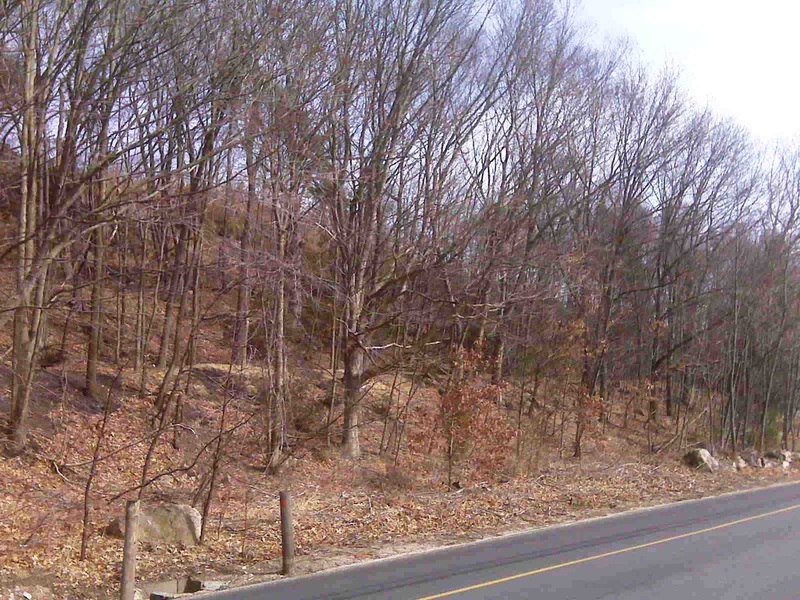 The Wilbur Cross Pkwy, of course, is not yet been built. 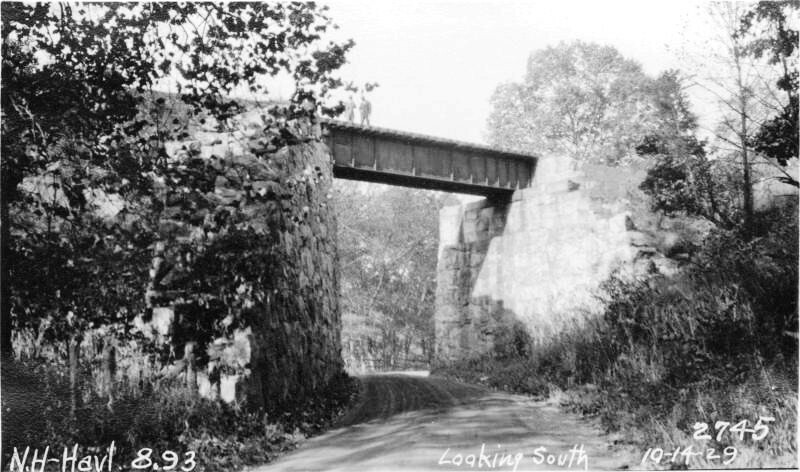 [4.50] This shot is of the NH&D bridge over what is now Grassy Hill Rd., CT Rte. 121. 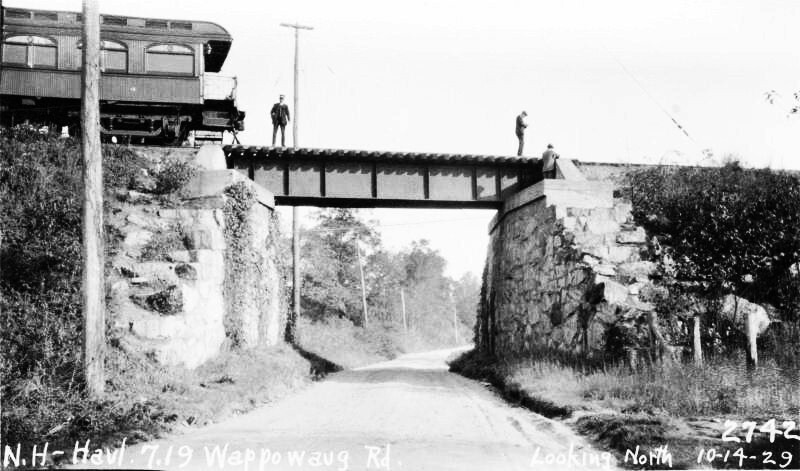 The writing on the bottom of this photo identifies as mile point 7.19 in 1929 at Wappowaug Rd., named for what is more commonly spelled as the Wepawaug River. The short distance between the Orange Rd. undercrossing and this overpass shows the start of a westward climb on the old NH&D. The business car, seen in use in the 10/14/1929 inspection photos and also elsewhere on Track 4B, was NYNH&H No. 4, ex-400, pictured in the Shoreliner [SL26.1.26,32]. [4.50.1] When the American Legion turned down the Orange station building, they settled in on another part of the NH&D line at 630 Grassy Hill Rd. 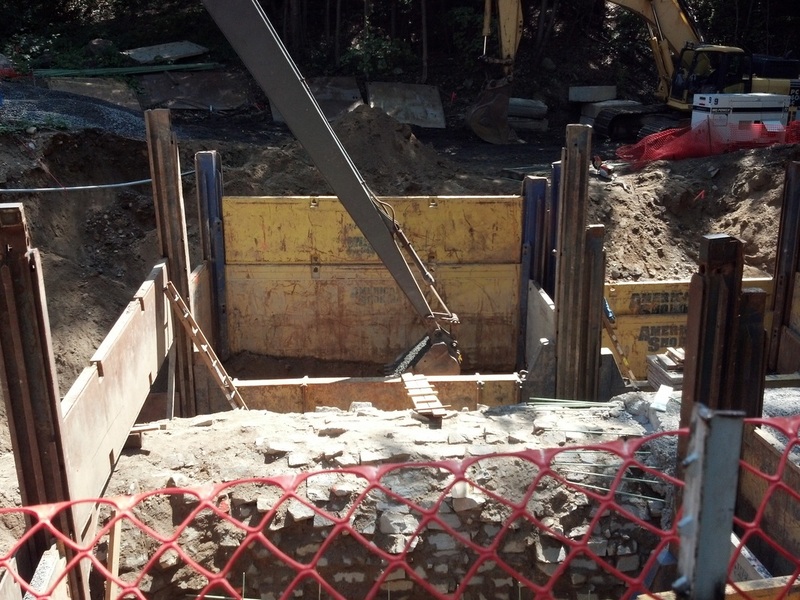 Behind their building were the abutments for the 'tin bridge' over the Wepawaug River. 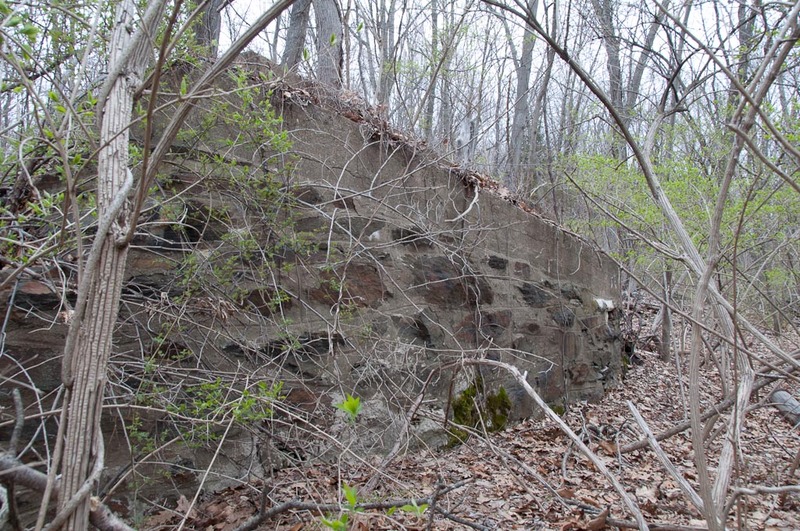 The photo on the left shows the east abutment. In the photo on the right, the dark area at the bottom is the river flowing at the foot of the one on the west side. The trash barrel is east of the river and may be there because the YMCA ran a swimming camp here in the early 1950s when these photos might have been taken. 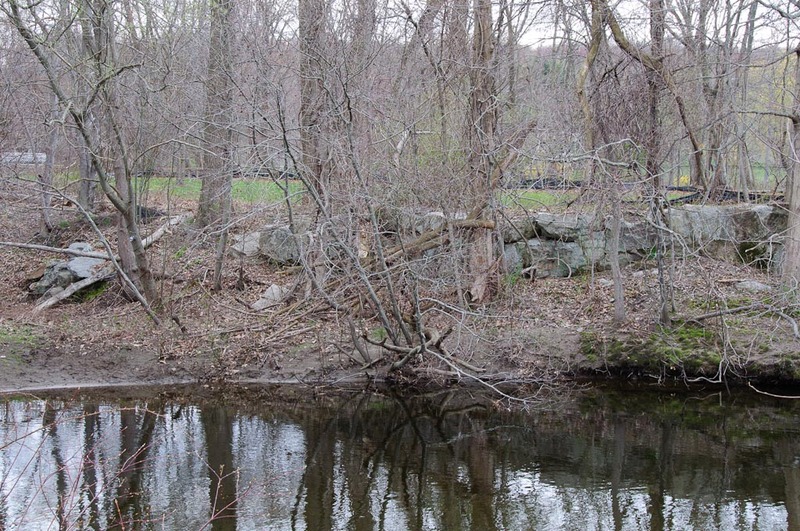 Both structures show a darker stone column in the center, which was probably the NH&D's original bridge support that was later fortified with the wing walls. The construction of "substantial stone abutments" for a bridge to replace the original crossing of the Wepawaug was noted by the railroad commissioners as completed in 1882 [CRC30.1883.21]. We still are hoping to get more information about the camp and also a photo of the 'tin bridge' itself. 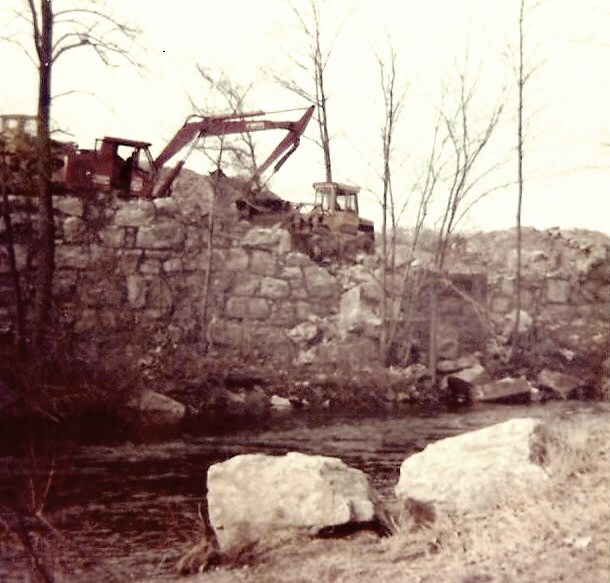 [4.50.2] When researching the history of the NH&D in the late 1970s, we found that only the west abutment was still standing. We had the good fortune to catch the bulldozers as they were taking the structure down for new home development at that time. 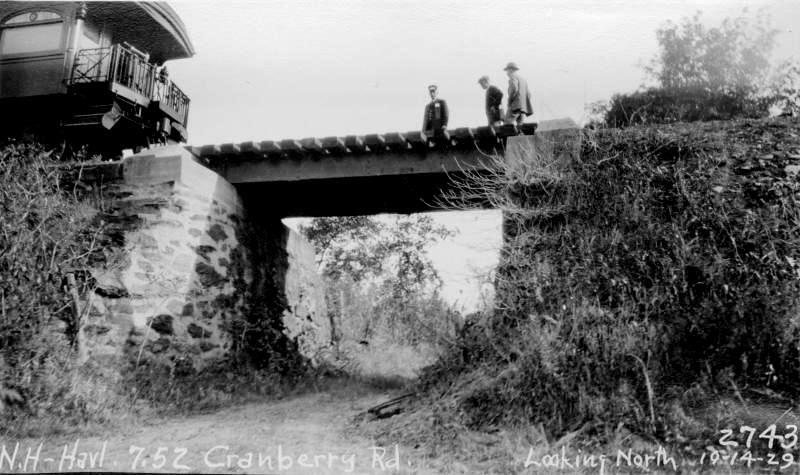 [4.51] This photo is of the NH&D bridge over Cranberry Lane that went west off Grassy Hill Rd. right where the Wilbur Cross Pkwy was built in 1941. 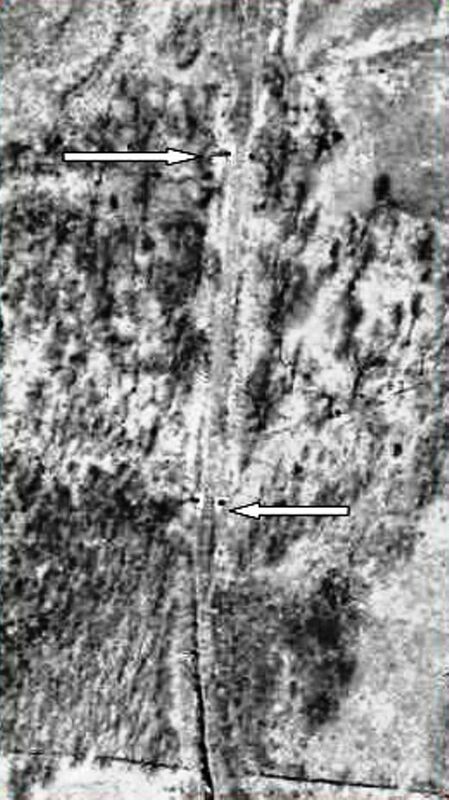 This is mile point 7.57 in the 1929 photo. 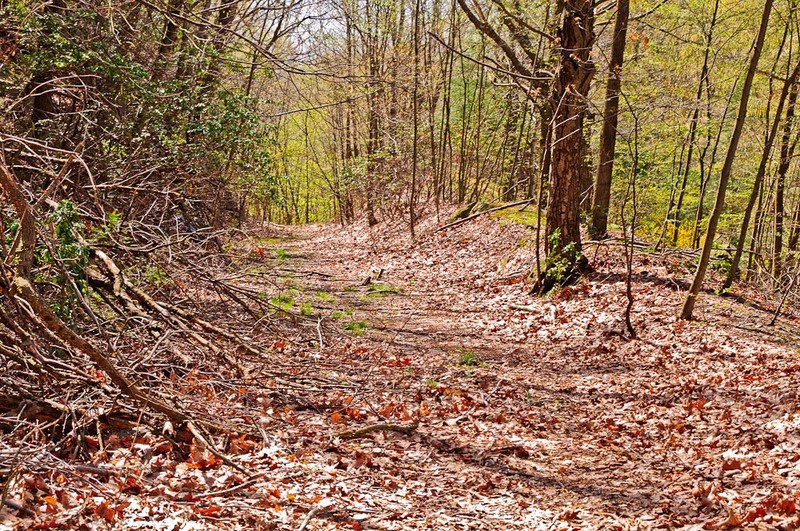 A short dead-end piece of this old road still exists off the southbound entrance ramp. [4.52] The Derby line turns almost due north through Orange's rural fields at this point. 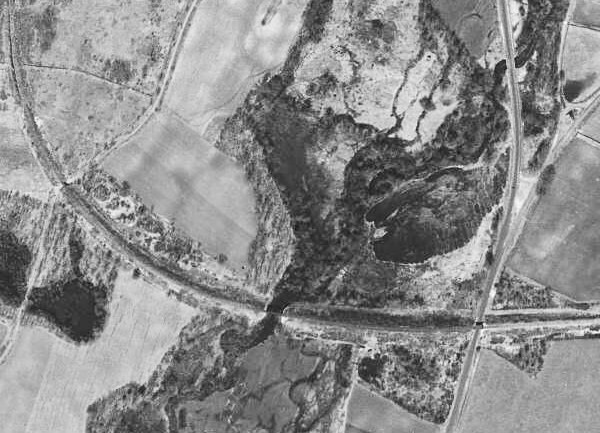 Vestiges of the town's farming heritage can be seen in the two cattle bridges at the arrows in this scan of the area below Turkey Hill Rd. which is seen running across the bottom of this shot. 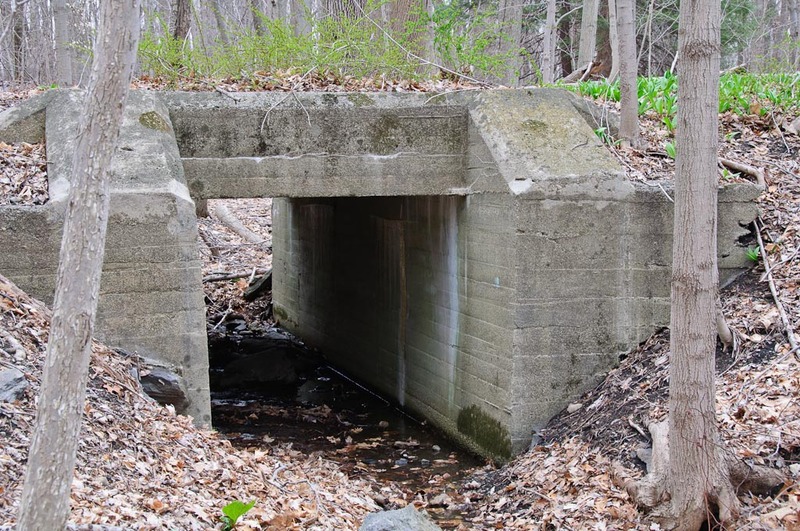 Even in 1934 these bridges were probably in use for the passage of livestock in this community with very strong agricultural roots. 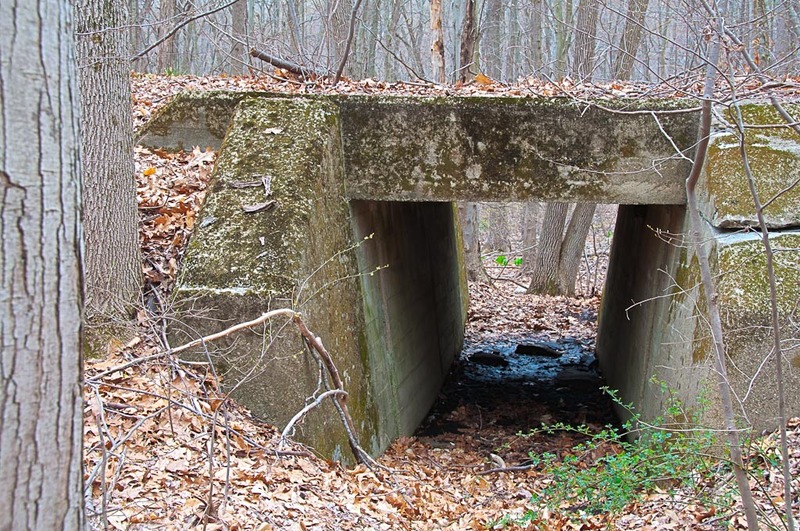 These cattle bridges are still in existence today between the Wilbur Cross Pkwy and Turkey Hill Rd. 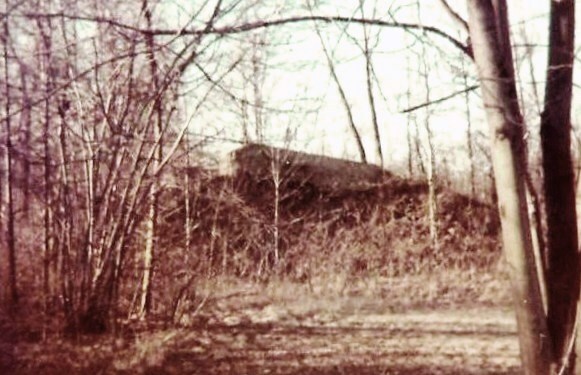 [4.53] The area above Turkey Hill school held a formidable obstacle for the NH&D in the form of another 55-ft cut that had to rival the Allingtown cousin of such great notoriety. 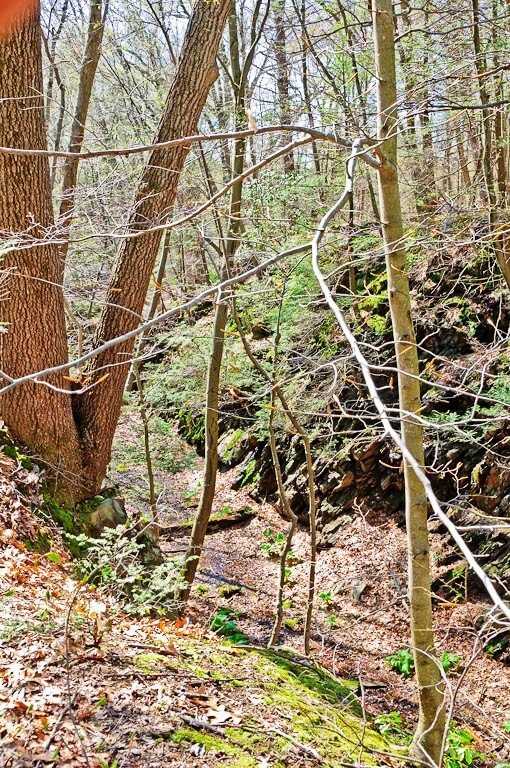 The local nickname for this ravine is Copperhead Canyon, though it is unknown if this has any basis in fact. 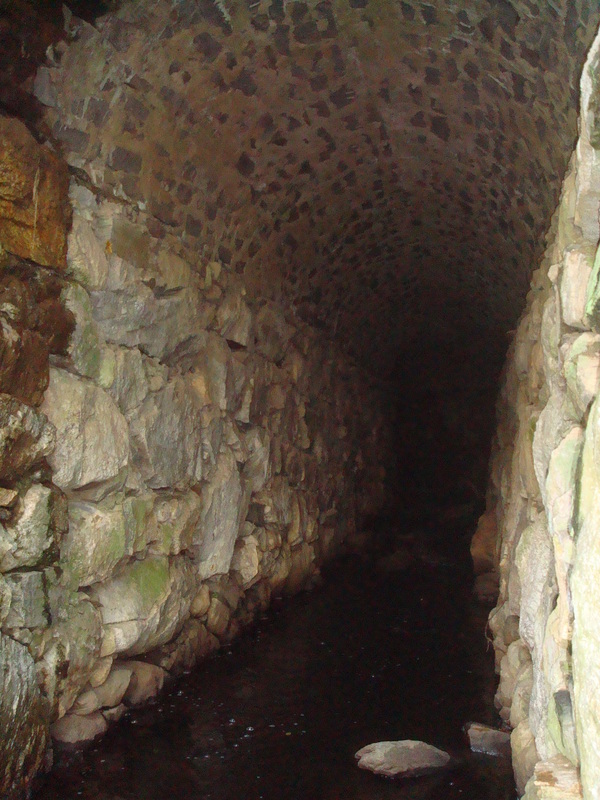 [4.53.1] This lovely culvert sits on the north side of Derby-Milford Rd. 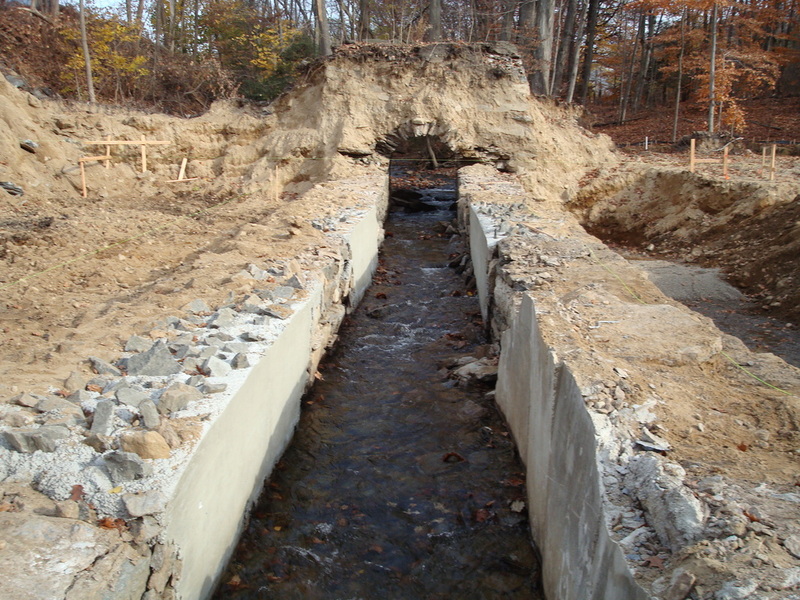 near East Slope Dr. and channels a Davis Brook tributary under the right of way and through this property. 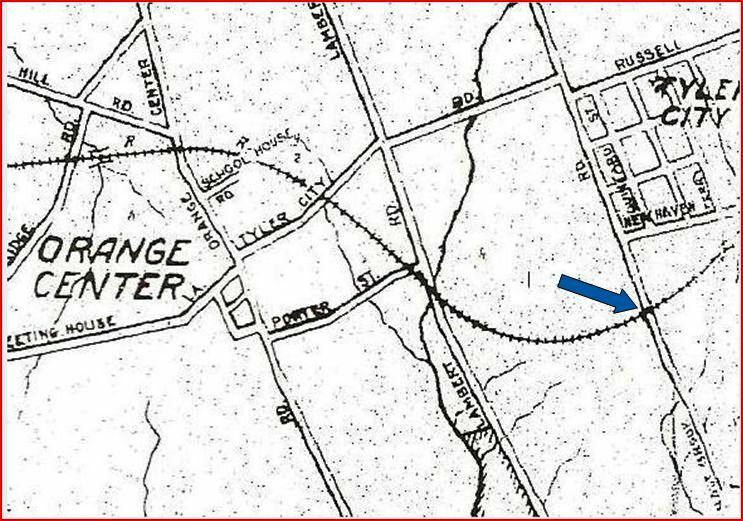 [4.54] This shot from the 1927 city directory map shows the area west of Orange center, with the crossings of Ridge Rd., Wepawaug Rd. (Grassy Hill Rd. today), the Wepawaug River, and then Cranberry La., all of which we have just toured. 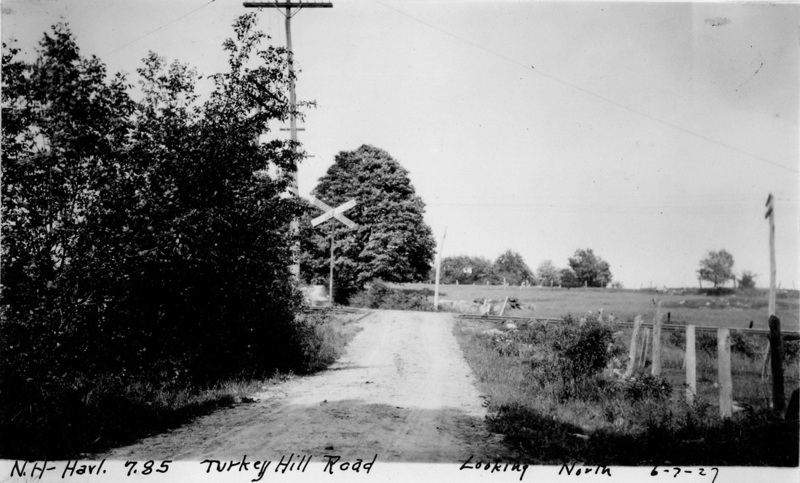 The map goes on to show the Turkey Hill Rd. grade crossing, the points where the overhead bridges stood on Derby-Milford Rd (red and yellow arrows), and the grade-level Tynan's crossing (blue arrow), all of which are seen in the next several photos. [4.55.1] The sketch at left is by an unknown artist and shows the second crossing of Derby-Milford Rd. 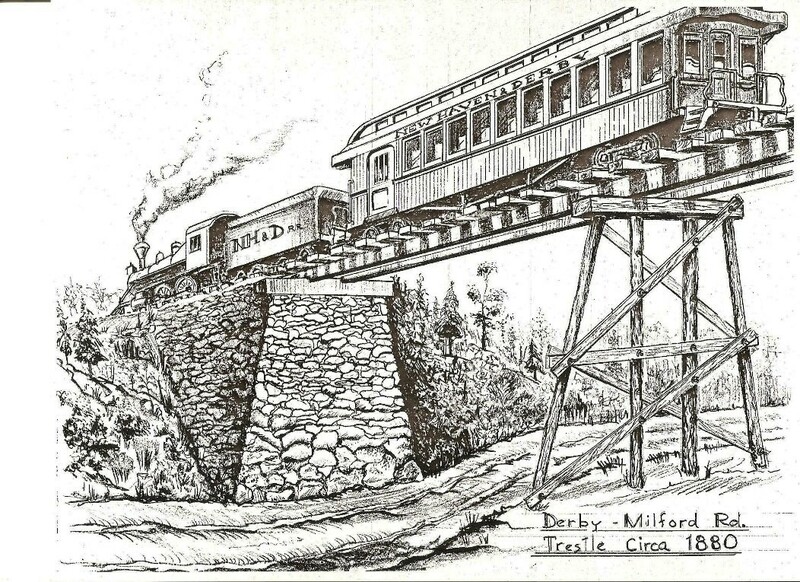 What is interesting about this image is that the artist was either working from a photo or first-hand knowledge that the original construction approaching the abutment was on trestle. The ca. 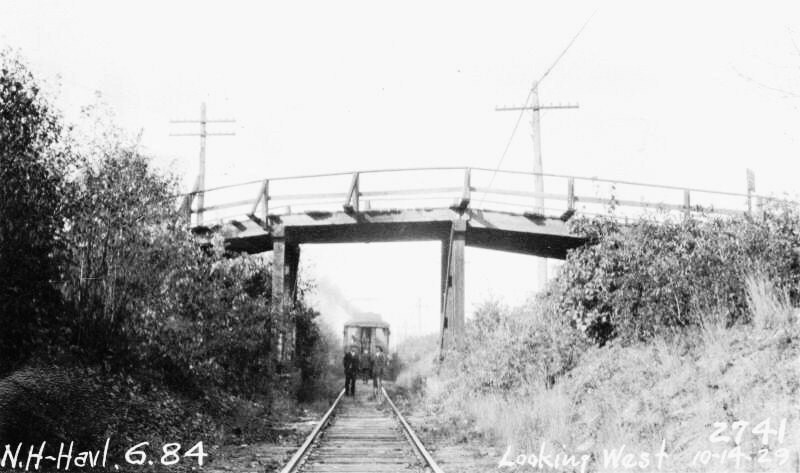 1880 date is correct since we know that the trestle work was filled in 1883. 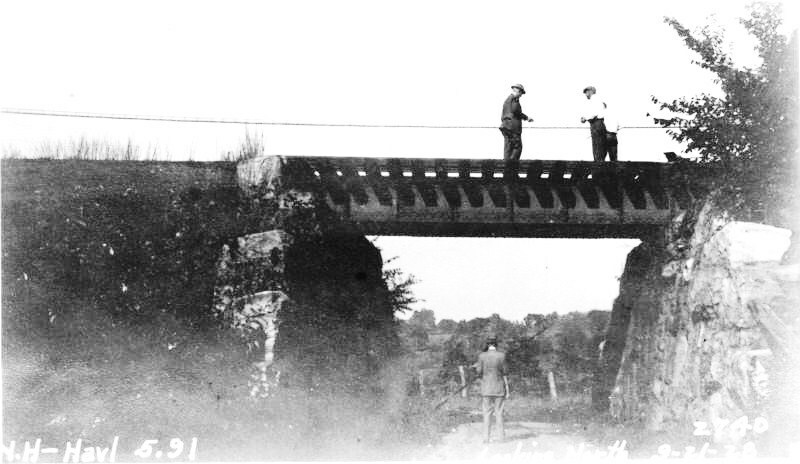 At that time, the south abutment was built and presumably the northerly one was rebuilt or strengthened to match it. Other details, like the shape of the abutment and the lettering on the engine, are less accurate. 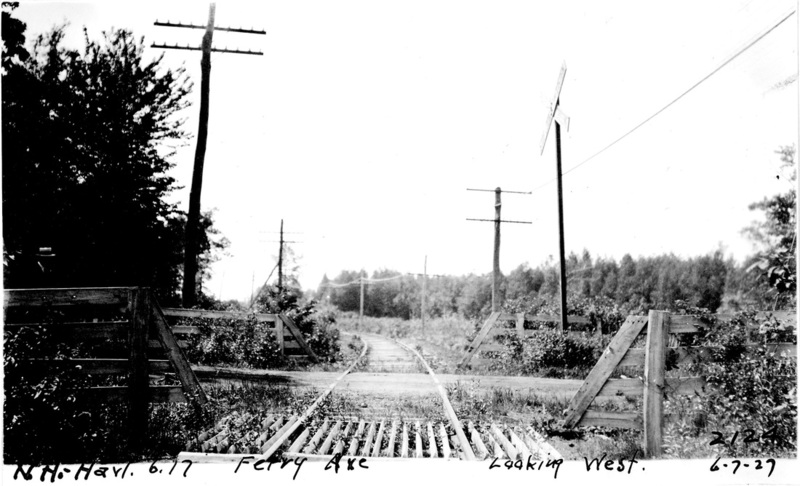 The 1929 PUC photo at middle says it looks south but it is really facing west at this point. The north abutment towers over Derby-Milford Rd. pretty much today as it did over a century ago, though what appears to be the upward regrading of the pavement may have stolen a little of its stature. Coming upon this massive roadside monument still must elicit surprise and awe from passing motorists, as it first did to us many, many years ago and inspired the life-long pursuit of ferroequinology. One has to admire the determination of the NH&D to build with obstacles such as these. [4.55.2] The NH&D ran on the elevated ledge seen in the middle of the shot on the left. The right of way is pretty much undisturbed in this area from the north abutment just visited. This is on your right as you are driving toward Derby. Our eyes could be deceiving us but the grayish matter to the left may be cinders left from days long gone. The third crossing of Derby-Milford Rd. was up ahead at the 964 address where the track was on a diagonal, heading for Derby Jct. at a point known as Tynan's crossing. Rails were still sticking out of the pavement there back in the late 1970s. The middle photo looks back toward the north abutment and the shot at right looks out from the abutment to Derby-Milford Rd. below. [4.55.3] This rare photo shows NH&D #30 headed for New Haven and, judging by the cattle fences, just approaching Tynan's grade crossing on today's Derby-Milford Rd. This crossing name has been verified in the PUC report sheets that accompanied their photographs. The date is of this shot sometime after #30's arrival in early May, 1888 and before the 1892 NYNH&H takeover. See details about this engine on Track 3 at MP 3.2.6. It was said to be "largest locomotive in the state" and capable of hauling "25 passenger or freight cars up 100-ft grades of Derby line." It had air brakes and was designed from the special drawings of NH&D Master Mechanic Kettendorf [NHER/05/12/1888/04]. Flying along here, it seems unfazed as it pulls a mere three-car consist, typical of the Derby line locals. 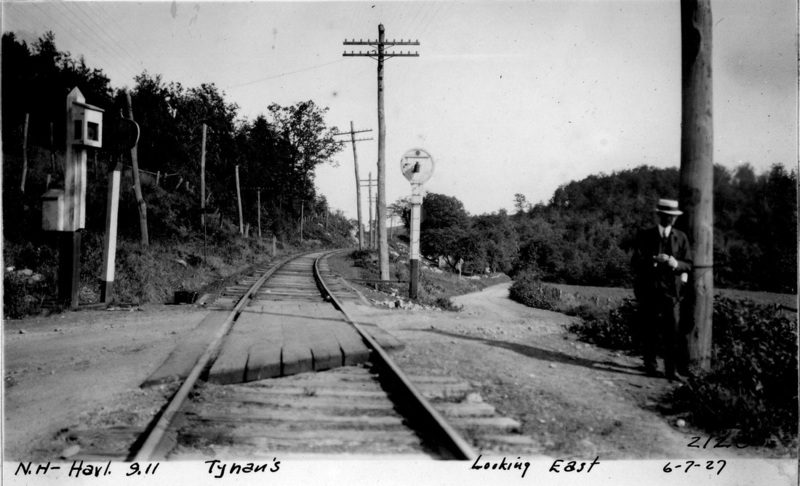 [4.55.4] This photo is the view the engineer was looking at in the picture just above as he approached Tynan's crossing going east. 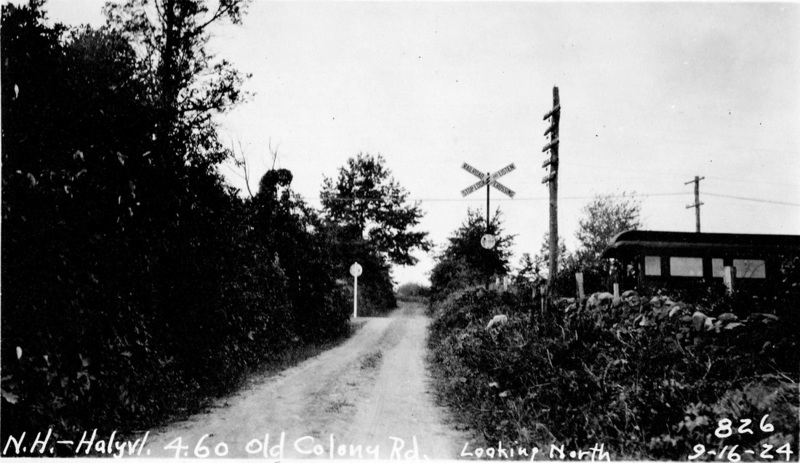 In this shot, the post seen on the outside of the curve, about 100 feet from the crossing, was a flanger warning sign. The flanger cleared snow and ice with the plow blade lowered between the rails. The sign warned the operator to raise the blade ahead of crossings and switches to avoid damage. The gentleman over to the right may be one of the photographers and the 'suitcases' on the ground to the left may well be the bulky equipment that they used in those days. 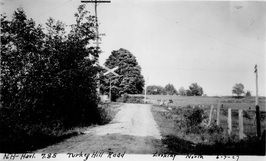 [4.55.6] This northward-looking photo shows the Hall discs on posts facing the roadway in both directions, the 'visible' grade crossing signals for motorists. These devices were obsolete as automatic block signals by this time and were being 'recycled' [click here]. Among the reasons was their implication as a cause of the 9/2/1913 rear-end collision at North Haven between the Bar Harbor and White Mountain Express trains which killed 21 passengers and injured 35 people [click here]. On the track at the right is NYNH&H business car No. 5, which apparently did the inspection honors on 9/21/1923. A drawing that shows the opposite side of this car with a slightly different window configuration is seen in Shoreliner 26.1 (1995), p. 33. Our thanks to Richard Fleischer for his help with these details. [4.55.7] This aerial view shows the NH&D line in 1930. Tynan's crossing is at the red arrow. 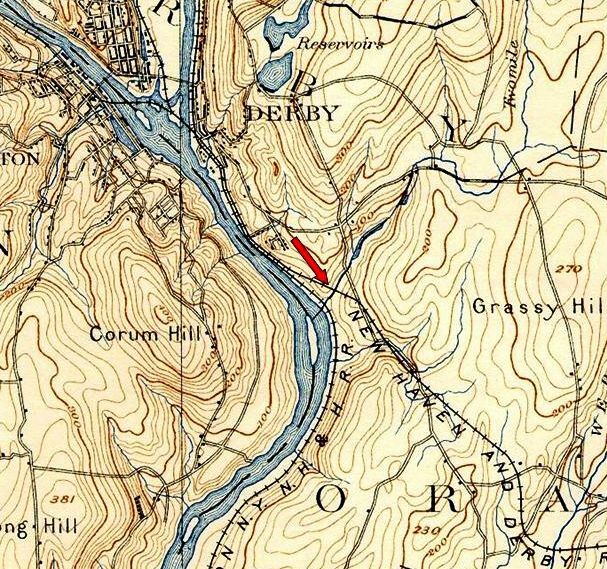 The darker area at the green arrow is the shadow cast by the 50-ft embankment that carried the track toward the Housatonic River. 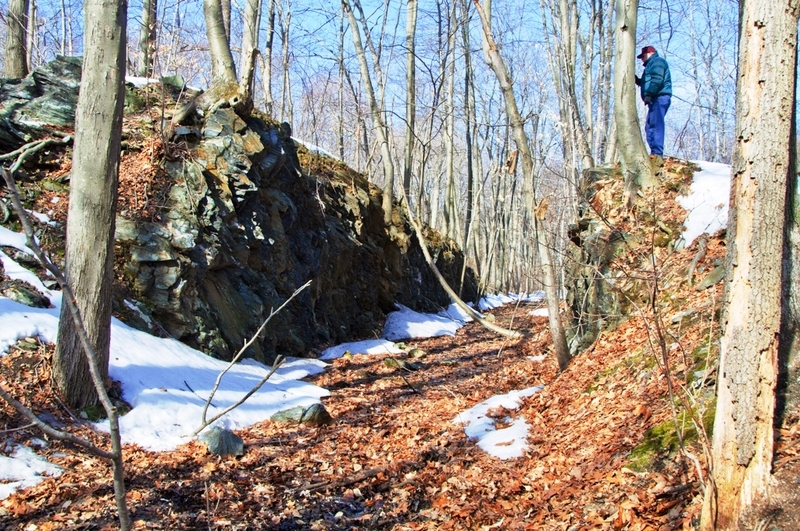 The blue arrow indicates the Two Mile Brook aqueduct at the southern end of St Peter Cemetery, some of the graves of which are visible north and east of the railroad. 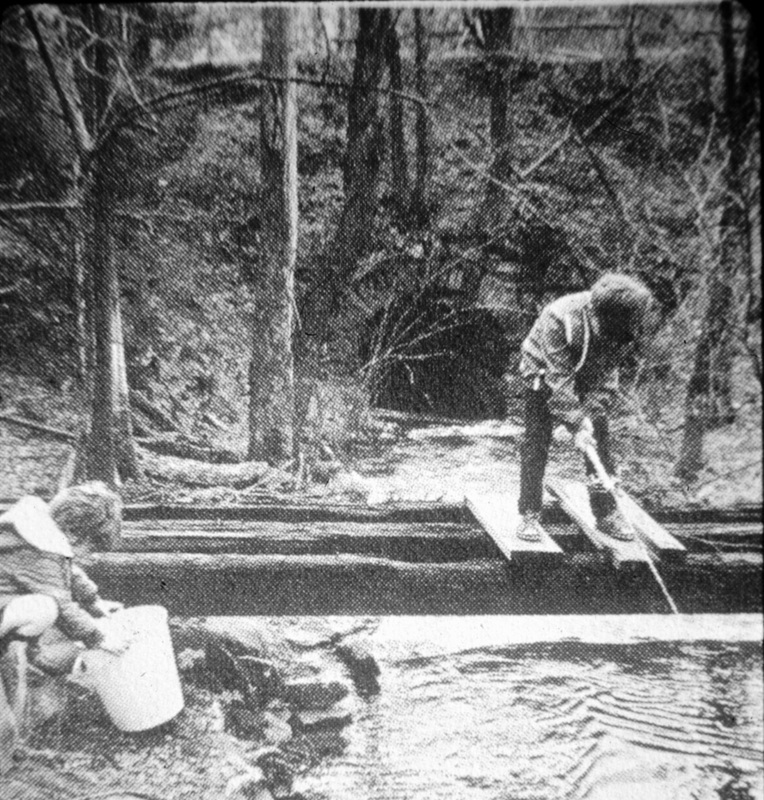 [4.55.8] This shot shows the open face of the NH&D embankment in 1980, northwest of Derby-Milford Rd and ahead of the crossing of Oil Mill Creek, now Two Mile Brook. The view shows how the right of way had been carved out then and by 2009 it had been further cut down almost to ground level. [4.56] The remains of what was once an extensive culvert with twin portals and a 140-ft channel stands west of Derby-Milford Rd. at the base of what was still a high, filled embankment in the 1980s when we began this research. 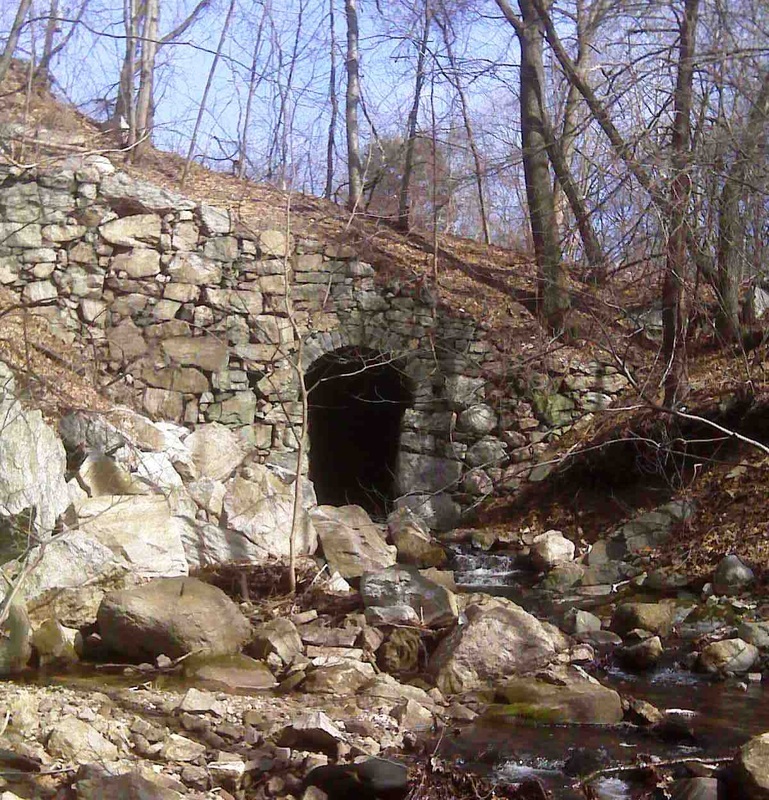 The culvert carried Oil Mill Creek under the railroad. 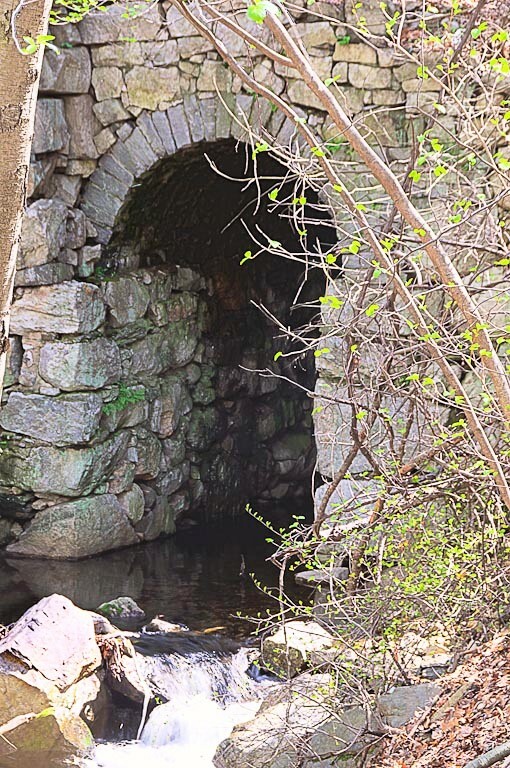 The NH&D was not built on trestle here, as we have learned from recent excavation work, so this culvert complex must have dated to 1870 or 1871. The shot on the upper left was taken on March 28, 2009. 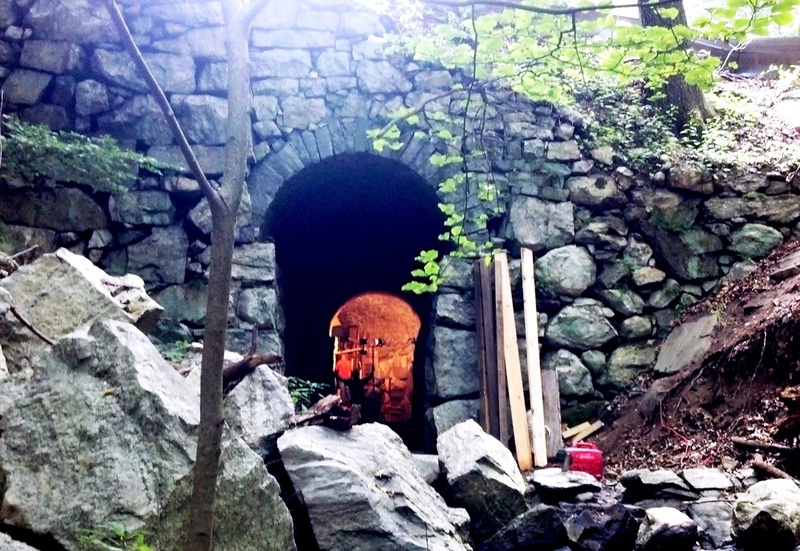 The upper middle photo is a look toward the interior of the east portal, now gone, with the arched underground aqueduct, some of which had collapsed [click here], dismantled. 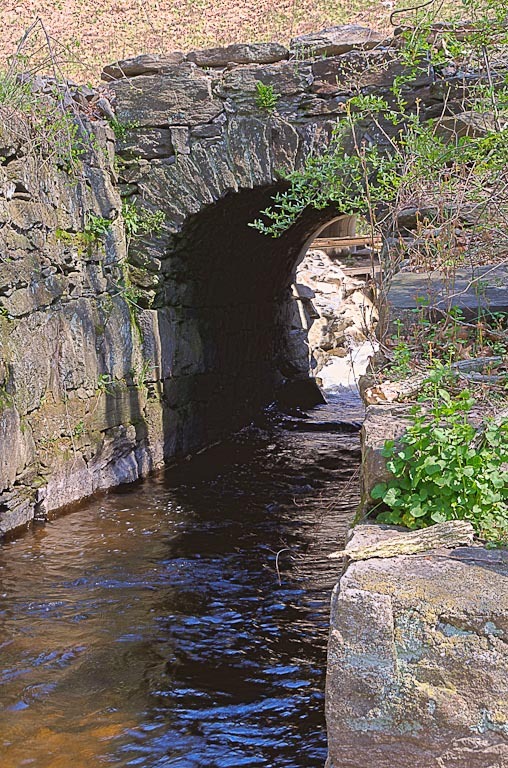 Due to fish-spawning considerations in the pool in the foreground, further work here was curtailed and the arch was not taken off the top of the west portal as had been planned. While intended to maximize water flow in the worst-storm case scenario, that decapitation would have robbed this historic structure of any remaining aesthetic charm. 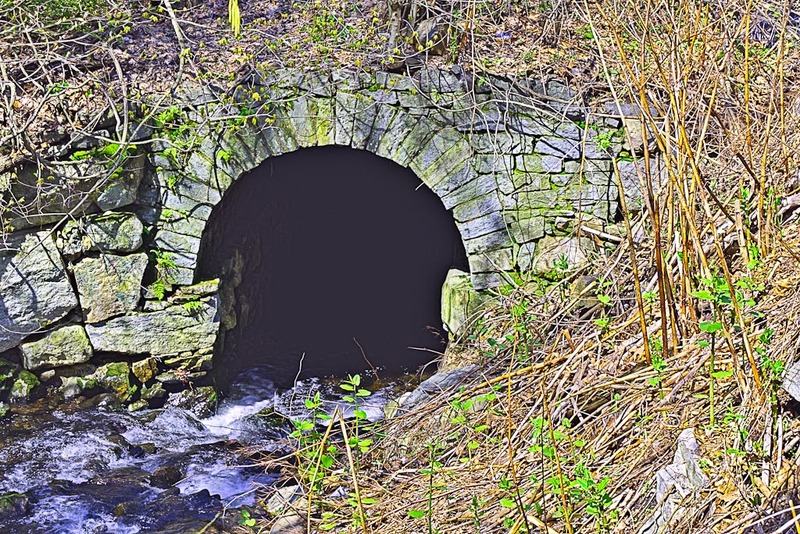 Instead, an overflow channel on the north side was created to handle whatever the old portal could not. 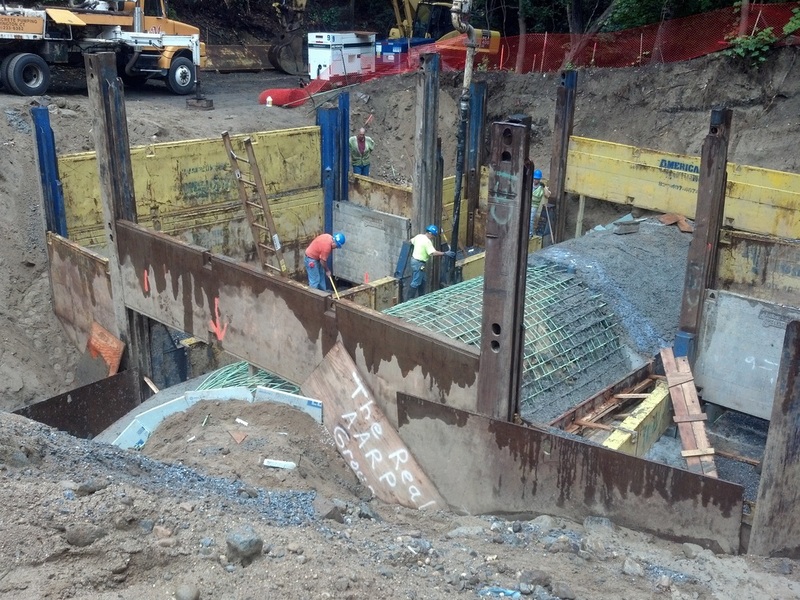 At upper right is an eastward-looking view of the new culvert behind the west portal. 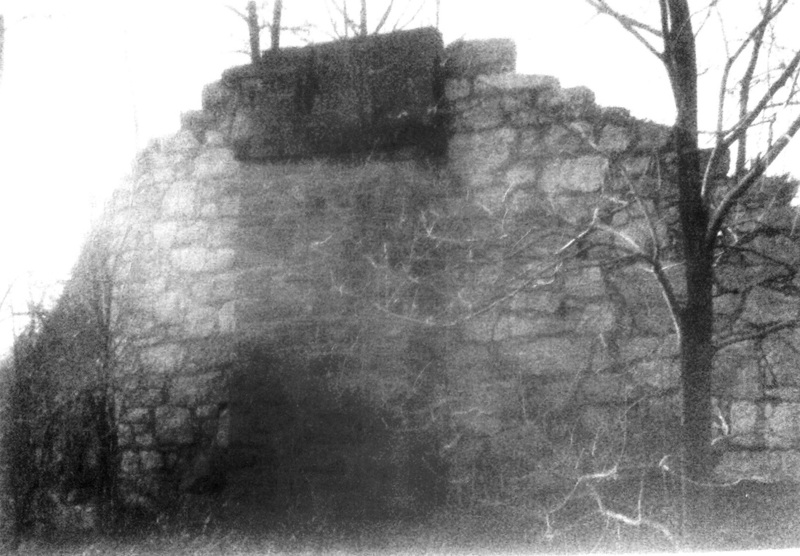 At lower left are two shots of the remaining structure. 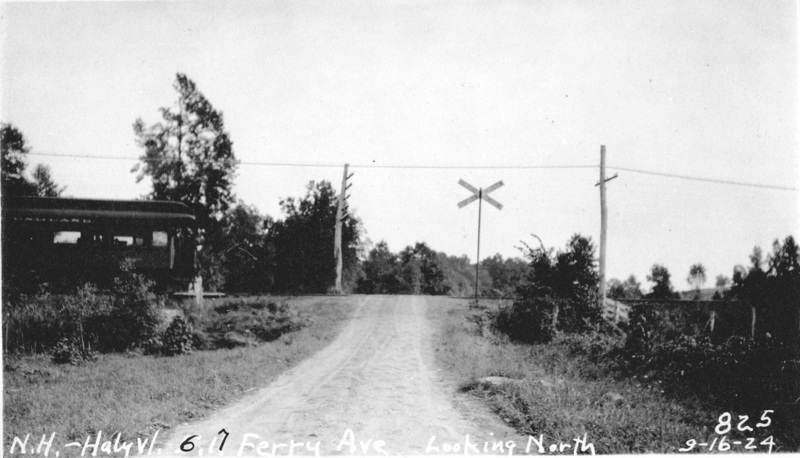 The photo at lower right looks southeast back toward Derby-Milford Rd., with the white house in the distance marking Tynan's grade crossing. While we would like to think that our involvement helped to bring this rescue about, we are grateful in any case to Mount St. Peter Cemetery and the wetlands commissions of both Derby and Orange for their consideration of an alternative plan that makes both the frolicking fish and the fastidious ferroequinologist (read iron-horse-ologist) happy. It is unfortunate when the relics of the past must be bulldozed, but this is a victory with what we have been able to preserve of this historic railroad. [4.56.1] This shot is from the southeast portion of the 1893 Derby quadrangle topographic map. 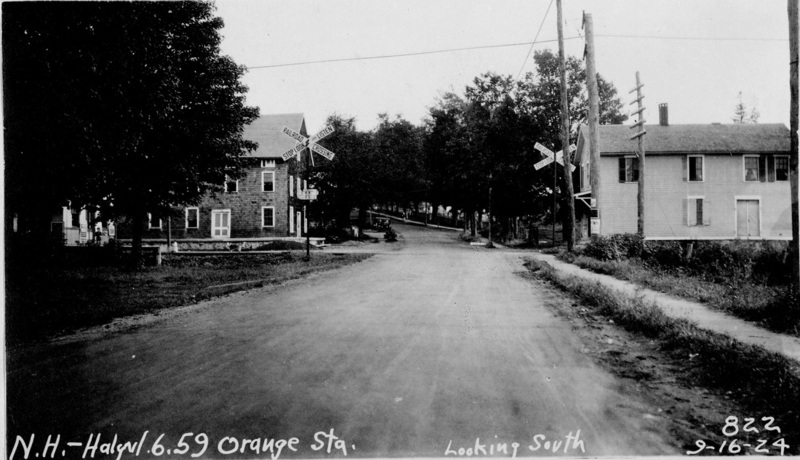 Click here for a backward look at the NH&D route through the town of Orange just traversed on the southwest portion of the New Haven quadrangle. 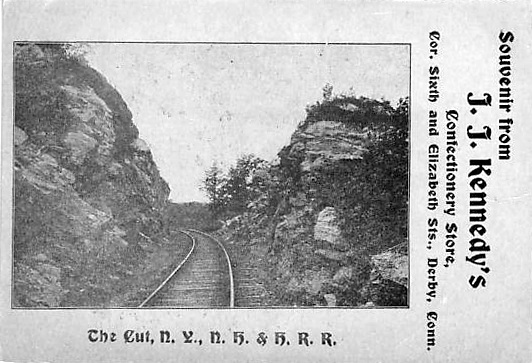 The steep westbound descent, just above the red arrow, is where Christopher Kelly and other passengers riding the first regular train from Ansonia to New Haven had to get out and push the consist up the grade back in 1871 [ES/07/17/1907/06]. 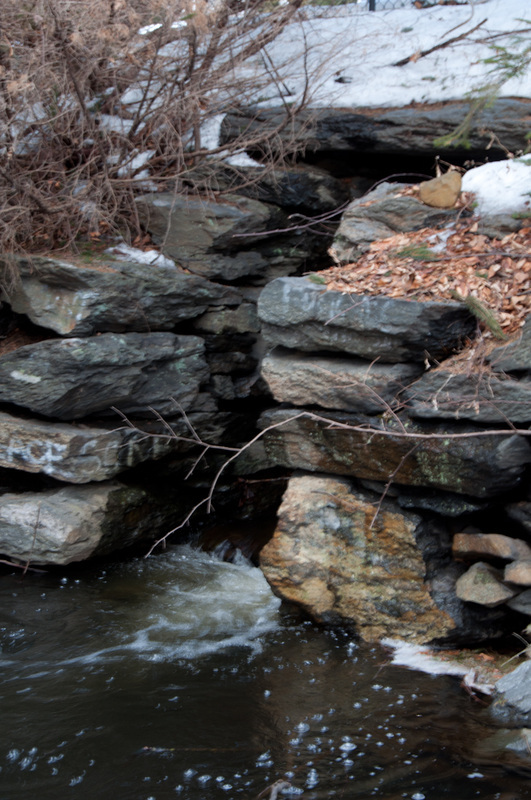 The red arrow also marks where Two Mile Brook flows through the culvert in the photos above. [4.56.2] The item at left shows the same photo used on another card in addition to the one Charlie Dunn sent us some time [middle]. This new one is postmarked 8/23/1902. 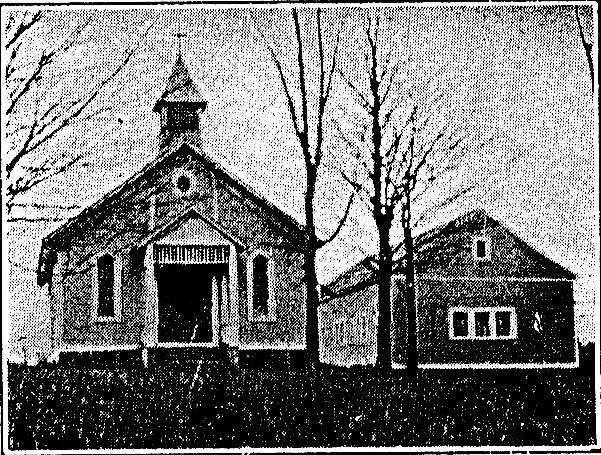 The 1896 Souvenir History of Derby and Shelton, Connecticut by Charles B. Gillespie, published by the Transcript Co., Derby, Conn., has the exact same image on page 5. The picture is captioned "THE CUT," N. Y., N. H. & H. R. R. This booklet also highlights businessmen of the time. One of these is Albert K. Kennedy, co-owner of the Transcript Co. whose Derby newspaper was the oldest in the lower Naugatuck Valley. The Kennedy Press, the printer shown on the address side of the new card, was probably a subsidiary operation, also perhaps located in the company's own building on Main Street which is pictured on page 34. Rob Novak, who is well versed in Valley history, is quite certain that the Kennedy confectionary store at Elizabeth and Sixth Sts. was a another family operation. He goes on to say that Albert, who died in 1918, represented Derby in the state legislature and that another presumed relation, James D. Kennedy, superintended the construction of the Ansonia, Derby & Birmingham electric freight line and witnessed the first running of the locomotive on May 17, 1888. See Track 4C, MP 4.66.2 for more on the AD&B. So much history from one image! It is interesting that this scene was thought to have so much sales potential, but as any collector will tell you, seemingly mundane, local railroad scenes and the plainest of structures were a staple of postcard publishing, especially in the first half of the last century. 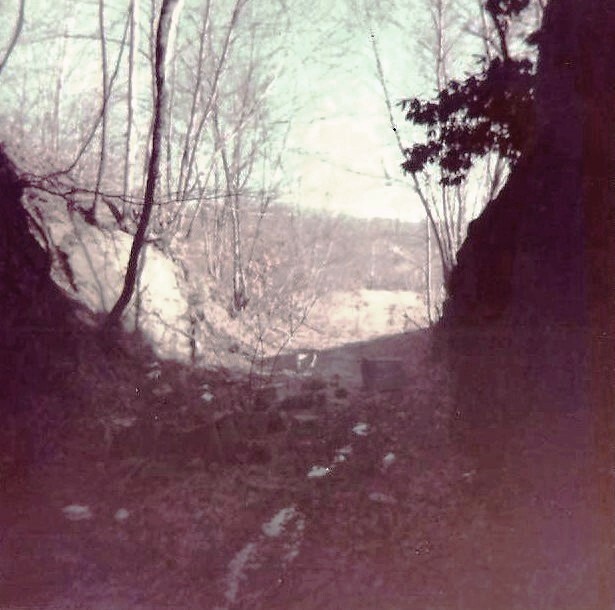 [4.56.3] This is a south-facing shot looking back toward the Derby cut. 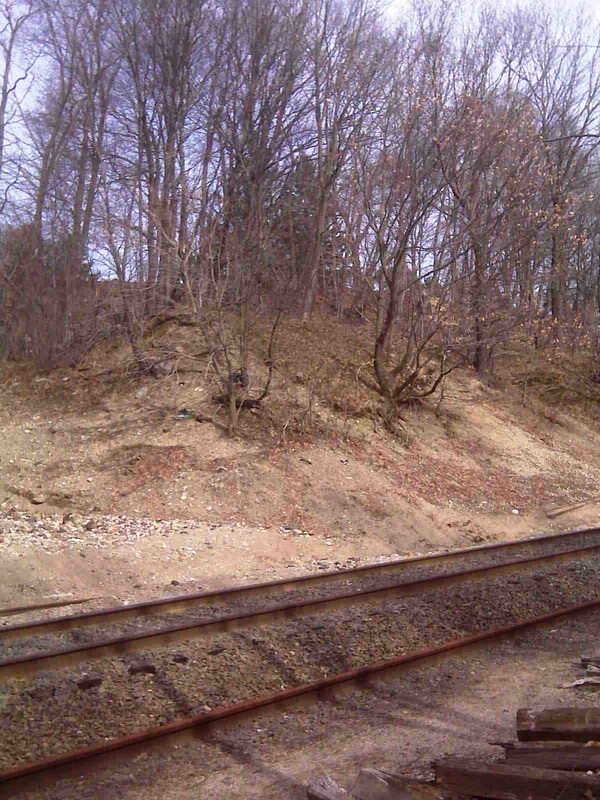 The height clearly shows the eastbound grade, perhaps 50 feet in a half-mile, likely the most challenging on the Derby line. 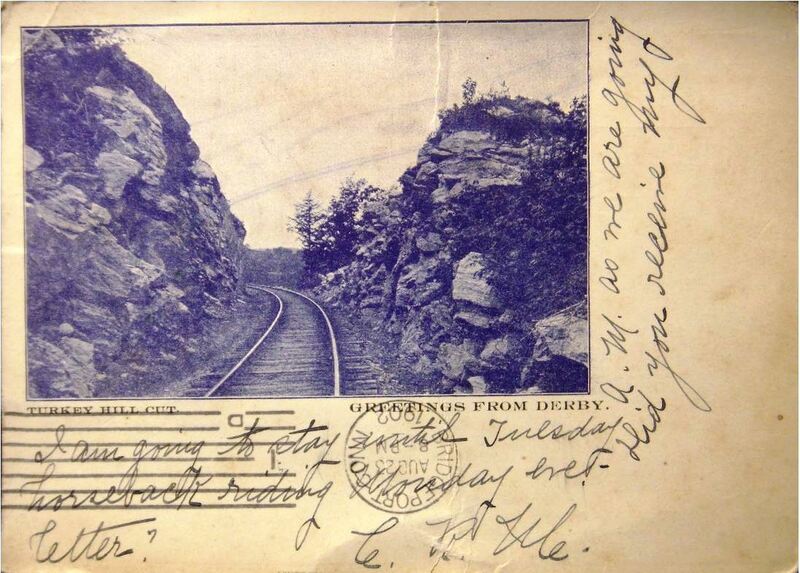 No wonder Christopher Kelly and his fellow passengers had to push the first train from Ansonia up this incline on August 9, 1871 [AES/07/17/1907/06]. Stalled engines at Turkey Hill would be a periodic occurrence until the NH&D acquired more powerful locomotives. Down to the right is the NRR track at river level. 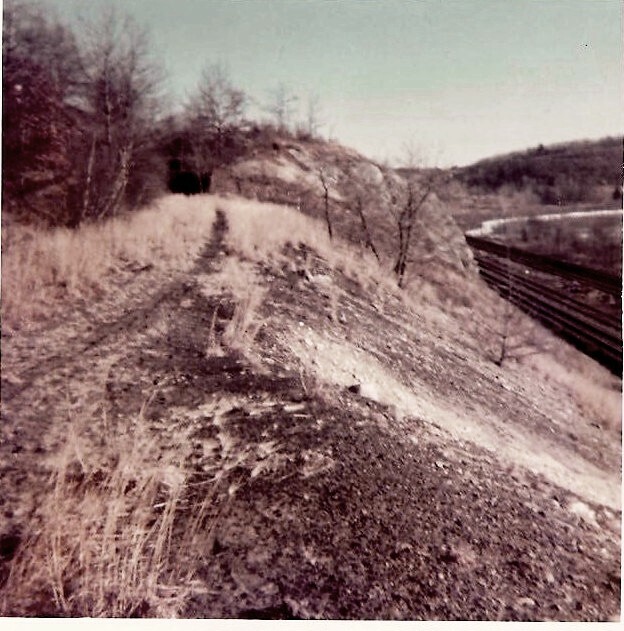 Dark patches of dirt or cinder ballast are still seen here on the right of way forty years after the line was torn up. [4.56.4] This is a spectacular find in the CHS collection! On the NRR, one can see a train heading south along the Housatonic River toward BALDWINS and NAUGATUCK JCT. Overhead and to its left, you can just make out a westbound NH&D consist on the crest of the hill, having just come out of the Derby Cut behind Mount St. Peter Cemetery. 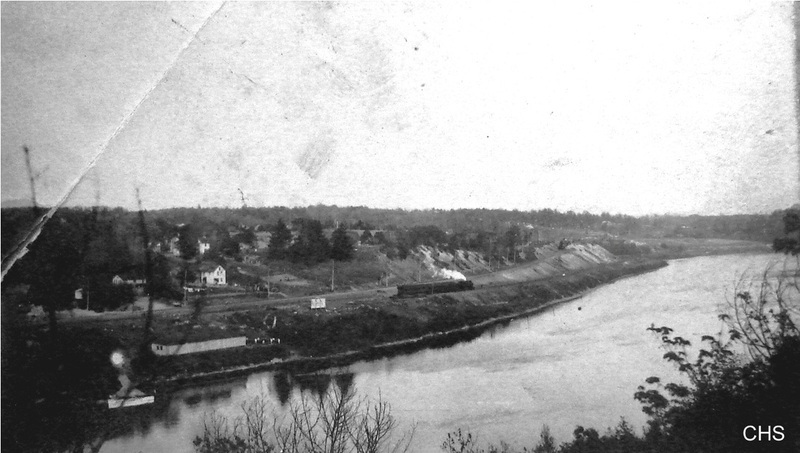 Jack Vagnini, a local rail history buff and member of the Derby Historical Society, took the time to clarify that the photo was taken from the Shelton side of the river, probably near today's Lafayette School, to get the angle, altitude and distance in this remarkably clear shot. We only wish we could see the numbers on the locomotives to pin down the date, which is probably in the 1890s. 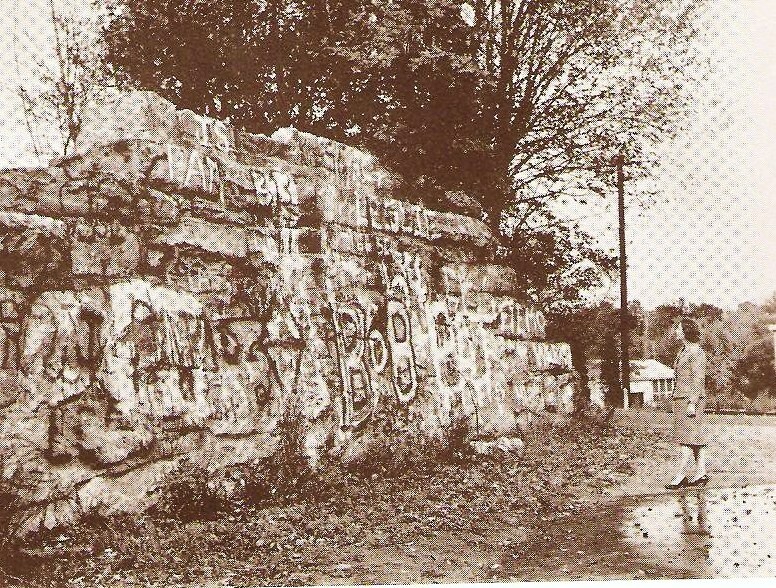 Jack also remembers the Derby Cut, since filled in by the cemetery, which explains why it is no longer there. Many thanks to Jack for his help. We always appreciate receiving input from readers and comments that help clarify our content. [4.56.5] Head west toward Derby on Rte. 34, turn left onto Chapel St. and then right onto Burtville Ave. 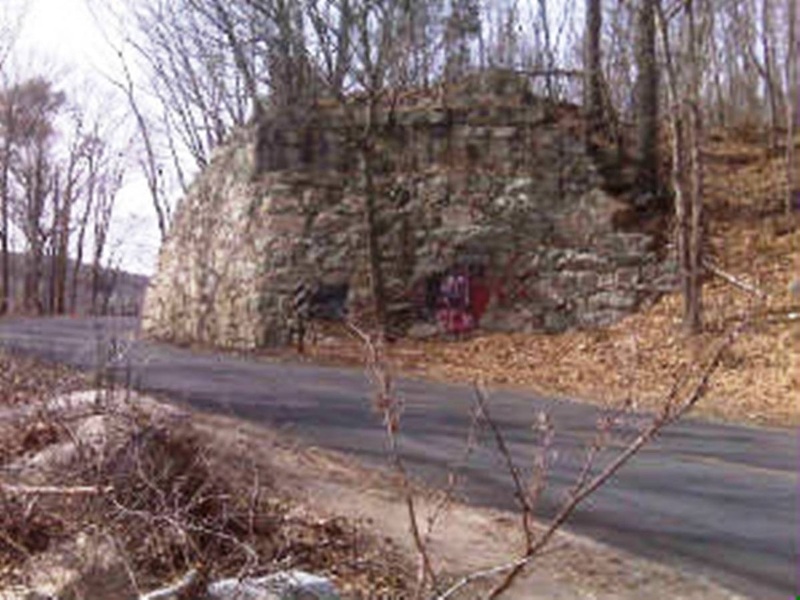 The Waterbury line is at the foot of the road. 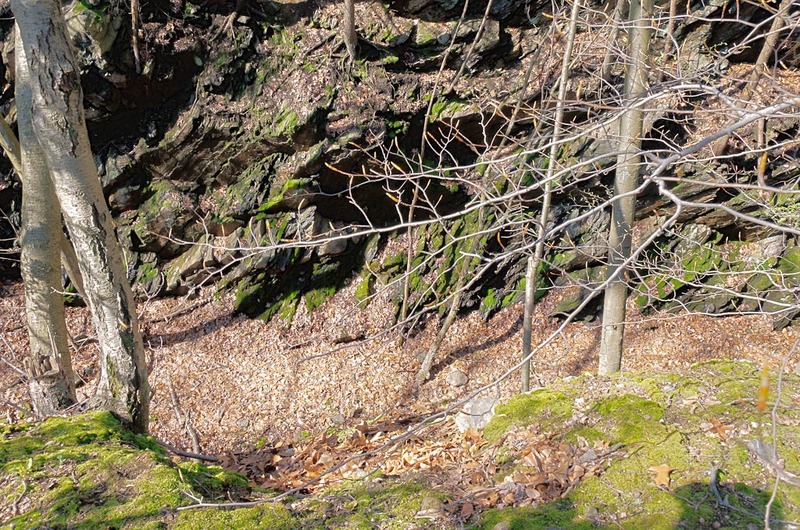 This is the exact point (right photo) where the NH&D reached river level alongside the NRR. It would begin to swing a bit eastward to curve back around and cross the NRR diagonally at Derby Jct. 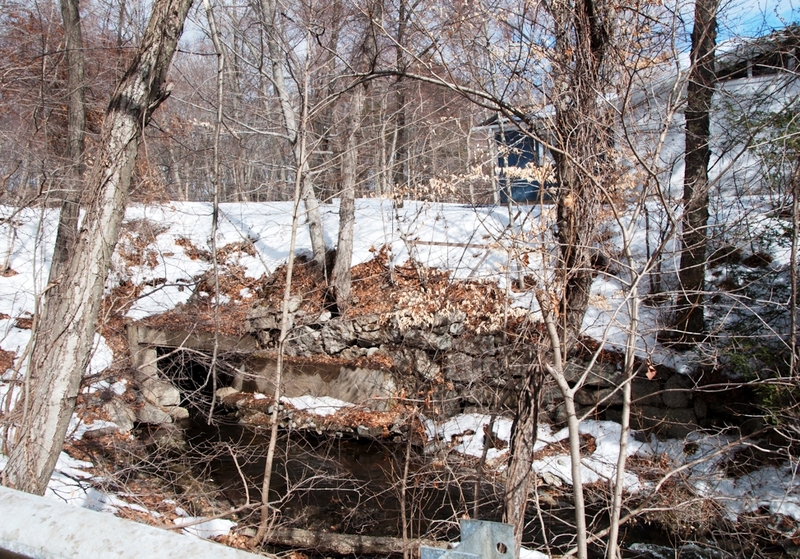 Some of the embankment that the NH&D once descended westward is still evident behind the warehouse at the end of the Burtville Ave. (left photo). Mount St. Peter Cemetery is farther up on the ridge overlooking this point.